The aggregate market value of the voting common stock held by non-affiliates of the registrant as of June 30, 2017, was approximately $372,424,686. Indicate the number of shares outstanding of each of the registrant’s classes of common stock as of the most recent practicable date, February 28, 2018. The definitive proxy statement of West Bancorporation, Inc., which was filed on March 1, 2018, is incorporated by reference into Part III hereof to the extent indicated in such Part. Certain statements in this report, other than purely historical information, including estimates, projections, statements relating to the Company’s business plans, objectives and expected operating results, and the assumptions upon which those statements are based, are “forward-looking statements” within the meanings of the Private Securities Litigation Reform Act of 1995, Section 27A of the Securities Act of 1933, as amended, and Section 21E of the Securities Exchange Act of 1934, as amended (the Exchange Act). Forward-looking statements may appear throughout this report. These forward-looking statements are generally identified by the words “believes,” “expects,” “intends,” “anticipates,” “projects,” “future,” “may,” “should,” “will,” “strategy,” “plan,” “opportunity,” “will be,” “will likely result,” “will continue” or similar references, or references to estimates, predictions or future events. Such forward-looking statements are based upon certain underlying assumptions, risks and uncertainties. Because of the possibility that the underlying assumptions are incorrect or do not materialize as expected in the future, actual results could differ materially from these forward-looking statements. Risks and uncertainties that may affect future results include: interest rate risk; competitive pressures; pricing pressures on loans and deposits; changes in credit and other risks posed by the Company’s loan and investment portfolios, including declines in commercial or residential real estate values or changes in the allowance for loan losses dictated by new market conditions or regulatory requirements; actions of bank and nonbank competitors; changes in local, national and international economic conditions; changes in legal and regulatory requirements, limitations and costs; changes in customers’ acceptance of the Company’s products and services; cyber-attacks; unexpected outcomes of existing or new litigation involving the Company; and any other risks described in the “Risk Factors” sections of this and other reports filed by the Company with the Securities and Exchange Commission (the SEC). The Company undertakes no obligation to revise or update such forward-looking statements to reflect current or future events or circumstances after the date hereof or to reflect the occurrence of unanticipated events. West Bancorporation, Inc. (the Company or West Bancorporation) is an Iowa corporation and a financial holding company registered under the Bank Holding Company Act of 1956, as amended (BHCA). The Company was formed in 1984 to own West Bank, an Iowa-chartered bank headquartered in West Des Moines, Iowa. West Bank is a business-focused community bank that was organized in 1893. The Company’s primary activity during 2017 was the ownership of West Bank. The Company’s and West Bank’s only business is banking, and therefore, no segment information is presented in this report. As a financial holding company, the Company has additional flexibility to engage in a broader range of financial activities through affiliates than are permissible for bank holding companies that are not financial holding companies. While the Company does not currently have a plan to engage in any new activities, as a financial holding company, it has the ability to respond more quickly to market developments and opportunities. The Company operates in three markets: central Iowa, which is generally the greater Des Moines metropolitan area; eastern Iowa, which is the area including and surrounding Iowa City and Coralville, Iowa; and the Rochester, Minnesota, area. (1) As presented, this is a non-GAAP financial measure. See Part II, Item 7 - "Non-GAAP Financial Measures" for additional details. Based on peer group analysis using data from the nine months ended September 30, 2017, which is the latest available data, the Company’s results and ratios for the fiscal year 2017 were better than those of each member of our defined peer group for each of the measures shown above, except for one peer that had a higher return on average assets. The Company’s ratios for the year ended December 31, 2017, were affected by a one-time increase in federal income tax expense related to the enactment of tax reform legislation on December 22, 2017. The tax legislation reduces the federal corporate tax rate from a maximum rate of 35 percent to a flat rate of 21 percent effective January 1, 2018. Accounting guidance requires companies to revalue their deferred tax assets or liabilities using the enacted tax rates, thus causing the one-time decline in net deferred tax assets and increase in tax expense. Management expects peer results to be similarly affected by the legislation. We currently believe our fiscal year 2017 results will remain in the top quartile once comparable peer results are available. West Bancorporation received national recognition from investment bank and research firm Raymond James in the annual Raymond James Community Bankers Cup, which identifies America’s top performing publicly traded community banks with assets between $500 million and $10 billion. The Raymond James Community Bankers Cup recognizes the top exchange-traded community banks based on various profitability, operational efficiency, and balance sheet metrics. Raymond James ranked West Bancorporation number 4 in the nation for 2016. This is the fourth consecutive year we have made this list. West Bancorporation was ranked number 6 among the publicly traded banks with assets between $1 billion and $5 billion in Bank Director Magazine’s 2017 Bank Performance Scorecard. The rankings were based on five measures related to profitability, capitalization and asset quality. This is the fifth consecutive year we have made this list. American Banker Magazine, the publication of the American Bankers Association, rated community banks based on three-year average return on average equity. West Bancorporation came in at number 9 in the United States. All public financial institutions across the United States with assets of less than $2 billion were eligible for inclusion on this list. The Company continued to grow in 2017, as loans outstanding at the end of 2017 totaled $1.51 billion compared to $1.40 billion at the end of 2016, an increase of 7.9 percent. Total deposits grew 17.1 percent at December 31, 2017 from the balances as of December 31, 2016. We believe the pipeline for new business is good, as we continue to focus efforts on sales through strengthening existing relationships and developing new relationships. We are confident in our ability to cultivate quality relationships and deliver excellent service. In November 2016, the Company’s Rochester, Minnesota, office was moved from a temporary leased space into a new permanent building. The Rochester office continued to experience strong growth in 2017. The Company believes that southeastern Minnesota is a desirable market and an economic bedrock due to the strength and projected growth of the Mayo Clinic, which is headquartered in Rochester. One of the keys to our 2017 operating success was an improvement in net interest income as a result of an increase in the average volume of interest-earning assets. Also contributing to our higher 2017 earnings was the continued low level of nonperforming assets. As of December 31, 2017, total nonperforming assets declined to $0.6 million, or 0.03 percent of total assets, compared to $1.0 million, or 0.06 percent of total assets, as of December 31, 2016. The Company declared and paid cash dividends on common stock totaling $0.71 per share in 2017 and declared an $0.18 quarterly dividend on January 24, 2018, payable on February 21, 2018 to stockholders of record on February 7, 2018. The Company expects to continue paying regular quarterly dividends in the future. In the opinion of management, the capital position of the Company was strong at December 31, 2017. The Company’s tangible common equity ratio at December 31, 2017 was 8.42 percent. As of December 31, 2017, the Company had no intangible assets or preferred stock. West Bank provides full-service community banking and trust services to customers located primarily in the Des Moines and Iowa City, Iowa, and Rochester, Minnesota, metropolitan areas. West Bank has eight offices in the Des Moines area, one office in Iowa City, one office in Coralville and one office in Rochester. West Bank offers many types of credit to its customers, including commercial, real estate and consumer loans. West Bank offers trust services, including the administration of estates, conservatorships, personal trusts and agency accounts. West Bank offers a full range of deposit services, including checking, savings and money market accounts and time certificates of deposit. West Bank also offers internet, mobile banking and treasury management services, which help to meet the banking needs of its customers. Treasury management services offered to business customers include cash management, client-generated automated clearing house transactions, remote deposit and fraud protection services. Also offered are merchant credit card processing and corporate credit cards. West Bank’s business strategy emphasizes strong business and personal relationships between West Bank and its customers and the delivery of products and services that meet the individualized needs of those customers. West Bank also emphasizes strong cost controls, while striving to achieve an above average return on equity and return on assets. To accomplish these goals, West Bank focuses on small- to medium-sized businesses in its local markets that traditionally wish to develop an exclusive relationship with a single bank. West Bank has the size to provide the personal attention required by local business owners and the financial expertise and entrepreneurial attitude to help businesses meet their financial service needs. The economies in our market areas are fairly diversified. The Des Moines, Iowa, metropolitan area has a population of approximately 624,000 and an unemployment rate of 2.4 percent. The major sources of employment in this area include financial services companies, healthcare providers and agribusiness industries along with local school districts and federal, state and local governments. Major employers include Wells Fargo & Co., Mercy Medical Center, UnityPoint Health, Hy-Vee Inc., Principal Financial Group and federal, state and local governments. The Iowa City, Iowa, metropolitan area has a population of approximately 95,000 and an unemployment rate of 2.0 percent. The major sources of employment in this area include educational institutions, healthcare providers, and local schools and government. Major employers include the University of Iowa and University of Iowa Hospitals and Clinics. The Rochester, Minnesota, metropolitan area has a population of approximately 114,000 and an unemployment rate of 2.2 percent. The major sources of employment in this area include healthcare providers, technology and agribusiness industries, and local schools and government. Major employers include Mayo Clinic, IBM and local governments. The market areas served by West Bank are highly competitive with respect to both loans and deposits. West Bank competes with other commercial banks, many of which are subsidiaries of other bank holding companies, credit unions, mortgage companies and other financial service providers. According to the Federal Deposit Insurance Corporation’s (FDIC) Summary of Deposits, as of June 30, 2017, there were 35 banks operating within Polk County, Iowa, where seven of West Bank’s offices are located. As of the same date, West Bank ranked fourth based on total deposits of all banking offices in Polk County. As of June 30, 2017, there were 17 banks within Johnson County, Iowa, which includes the Iowa City and Coralville offices. As of the same date, West Bank ranked fourth based on total deposits of all banking offices in Johnson County. West Bank also has one office located in Dallas County, Iowa. For the entire state of Iowa, West Bank ranked seventh in terms of deposit size as of June 30, 2017. As previously mentioned, West Bank also has one office located in Rochester, Minnesota. Some of West Bank’s competitors are locally controlled, while others are regional, national or international companies. The larger national or regional banks have certain competitive advantages due to their ability to undertake substantial advertising campaigns and allocate their investment assets to out-of-market geographic regions with potentially higher returns. Such banks also offer certain services, for example, international and conduit financing transactions, which are not offered directly by West Bank. These larger banking organizations also have much higher legal lending limits than West Bank, and therefore, may be better able to service large regional, national and global commercial customers. In order to compete to the fullest extent possible with the other financial institutions in its primary market areas, West Bank uses the flexibility and knowledge of its local management, Board of Directors and community advisors. West Bank has a group of community advisors in each of its markets who provide insight to management on current business activity levels and trends. West Bank seeks to capitalize on customers who desire to do business with a local institution. This includes emphasizing specialized services, local promotional activities, and personal contacts by West Bank’s officers, directors and employees. In particular, West Bank competes for loans primarily by offering competitive interest rates, experienced lending personnel with local decision-making authority, flexible loan arrangements, quality products and services, and proactive relationship management. West Bank competes for deposits principally by offering depositors a variety of straight-forward deposit products and convenient office locations and hours, along with electronic access and other personalized services. West Bank also competes with the general financial markets for funds. Yields on corporate and government debt securities and commercial paper affect West Bank’s ability to attract and hold deposits. West Bank also competes for funds with money market accounts and similar investment vehicles offered by brokerage firms, mutual fund companies, internet banks and others. The competition for these funds is based almost exclusively on yields to customers. The Company and West Bank had approximately 162 full-time equivalent employees as of December 31, 2017. FDIC-insured institutions, their holding companies and their affiliates are extensively regulated under federal and state law. As a result, our growth and earnings performance may be affected not only by management decisions and general economic conditions, but also by the requirements of federal and state statutes and by the regulations and policies of various bank regulatory agencies, including the Iowa Division of Banking, the Board of Governors of the Federal Reserve System (Federal Reserve), the FDIC and the Consumer Financial Protection Bureau (CFPB). Furthermore, taxation laws administered by the Internal Revenue Service and state taxing authorities, accounting rules developed by the Financial Accounting Standards Board (FASB), securities laws administered by the SEC and state securities authorities, and anti-money laundering laws enforced by the U.S. Department of the Treasury (Treasury) have an impact on our business. The effect of these statutes, regulations, regulatory policies and accounting rules are significant to our operations and results. Federal and state banking laws impose a comprehensive system of supervision, regulation and enforcement on the operations of FDIC-insured institutions, their holding companies and affiliates that is intended primarily for the protection of the FDIC-insured deposits and depositors of banks, rather than stockholders. These federal and state laws, and the regulations of the bank regulatory agencies issued under them, affect, among other things, the scope of our business; the kinds and amounts of investments we may make; reserve requirements; required capital levels relative to our assets; the nature and amount of collateral for loans; the establishment of branches; our ability to merge, consolidate and acquire; dealings with our insiders and affiliates; and our payment of dividends. In reaction to the global financial crisis and particularly following the passage of the Dodd-Frank Wall Street Reform and Consumer Protection Act of 2010 (Dodd-Frank Act), we experienced heightened regulatory requirements and scrutiny. Although the reforms primarily targeted systemically important financial service providers, their influence filtered down in varying degrees to community banks over time and caused our compliance and risk management processes, and the costs thereof, to increase. After the 2016 federal elections, momentum to decrease the regulatory burden on community banks gathered strength. Although these deregulatory trends continue to receive much discussion among the banking industry, lawmakers and bank regulatory agencies, little substantive progress has yet been made. The true impact of proposed reforms remains difficult to predict with any certainty. The supervisory framework for U.S. banking organizations subjects banks and bank holding companies to regular examination by their respective regulatory agencies, which results in examination reports and ratings that are not publicly available and that can impact the conduct and growth of their business. These examinations consider not only compliance with applicable laws and regulations, but also capital levels, asset quality and risk, management ability and performance, earnings, liquidity and various other factors. The regulatory agencies generally have broad discretion to impose restrictions and limitations on the operations of a regulated entity where the agencies determine, among other things, that such operations are unsafe or unsound, fail to comply with applicable law or are otherwise inconsistent with laws and regulations or with the supervisory policies of these agencies. The following is a summary of the material elements of the supervisory and regulatory framework applicable to the Company and West Bank, beginning with a discussion of the continuing regulatory emphasis on our capital levels. It does not describe all of the statutes, regulations and regulatory policies that apply, nor does it restate all of the requirements of those that are described. The descriptions are qualified in their entirety by reference to the particular statutory and regulatory provision. Regulatory capital represents the net assets of a banking organization available to absorb losses. Because of the risks attendant to their business, FDIC-insured institutions are generally required to hold more capital than other businesses, which directly affects our earnings capabilities. While capital has historically been one of the key measures of the financial health of both bank holding companies and banks, its role became fundamentally more important in the wake of the global financial crisis, as the banking regulators recognized that the amount and quality of capital held by banks prior to the crisis was insufficient to absorb losses during periods of severe stress. Certain provisions of the Dodd-Frank Act and Basel III, discussed below, establish strengthened capital standards for banks and bank holding companies, require more capital to be held in the form of common stock, and disallow certain funds from being included in capital determinations. These standards represent regulatory capital requirements that are meaningfully more stringent than those in place previously. Minimum Required Capital Levels. Banks have been required to hold minimum levels of capital based on guidelines established by the bank regulatory agencies since 1983. The minimums have been expressed in terms of ratios of capital divided by total assets. As discussed below, bank capital measures have become more sophisticated over the years and have focused more on the quality of capital and the risk of assets. Bank holding companies have historically had to comply with less stringent capital standards than their bank subsidiaries and have been able to raise capital with hybrid instruments such as trust preferred securities. The Dodd-Frank Act mandated the Federal Reserve to establish minimum capital levels for holding companies on a consolidated basis as stringent as those required for FDIC-insured institutions. A result of this change is that the proceeds of hybrid instruments, such as trust preferred securities, are being excluded from capital over a phase-out period. However, if such securities were issued prior to May 19, 2010 by bank holding companies with less than $15 billion of assets, they may be retained, subject to certain restrictions. Because we have assets of less than $15 billion, we are able to maintain our trust preferred proceeds as capital but we have to comply with new capital mandates in other respects and will not be able to raise capital in the future through the issuance of trust preferred securities. The Basel International Capital Accords. The risk-based capital guidelines for U.S. banks since 1989 were based upon the 1988 capital accord known as “Basel I” adopted by the international Basel Committee on Banking Supervision, a committee of central banks and bank supervisors that acts as the primary global standard-setter for prudential regulation, as implemented by the U.S. bank regulatory agencies on an interagency basis. The accord recognized that bank assets for the purpose of the capital ratio calculations needed to be risk-weighted (the theory being that riskier assets should require more capital) and that off-balance sheet exposures needed to be factored in the calculations. Basel I had a very simple formula for assigning risk weights to bank assets from 0 percent to 100 percent based on four categories. In 2008, the banking agencies collaboratively began to phase-in capital standards based on a second capital accord, referred to as “Basel II,” for large or “core” international banks (generally defined for U.S. purposes as having total assets of $250 billion or more, or consolidated foreign exposures of $10 billion or more) known as “advanced approaches” banks. The primary focus of Basel II was on the calculation of risk weights based on complex models developed by each advanced approaches bank. As most banks were not subject to Basel II, the U.S. bank regulators worked to improve the risk sensitivity of Basel I standards without imposing the complexities of Basel II. This “standardized approach” increased the number of risk weight categories and recognized risks well above the original 100 percent risk-weighting. It is institutionalized by the Dodd-Frank Act for all banking organizations, even for the advanced approaches banks, as a floor. On September 12, 2010, the Group of Governors and Heads of Supervision, the oversight body of the Basel Committee on Banking Supervision, announced agreement on a strengthened set of capital requirements for banking organizations around the world, known as “Basel III”, to address deficiencies recognized in connection with the global financial crisis. The Basel III Rule. In July 2013, the U.S. federal banking agencies approved the implementation of the Basel III regulatory capital reforms in pertinent part, and, at the same time, promulgated rules effecting certain changes required by the Dodd-Frank Act (the Basel III Rule). In contrast to capital requirements historically, which were in the form of guidelines, Basel III was released in the form of regulations by each of the regulatory agencies. The Basel III Rule is applicable to all banking organizations that are subject to minimum capital requirements, including federal and state banks and savings and loan associations, as well as to bank and savings and loan holding companies, other than “small bank holding companies” (generally bank holding companies with consolidated assets of less than $1 billion). The Basel III Rule required higher capital levels, increased the required quality of capital, and required more detailed categories of risk-weighting of riskier, more opaque assets. For nearly every class of assets, the Basel III Rule requires a more complex, detailed and calibrated assessment of credit risk and calculation of risk weightings. Not only did the Basel III Rule increase most of the required minimum capital ratios in effect prior to January 1, 2015, but it introduced the concept of Common Equity Tier 1 Capital, which consists primarily of common stock, related surplus (net of Treasury stock), retained earnings, and Common Equity Tier 1 minority interests subject to certain regulatory adjustments. The Basel III Rule also changed the definition of capital by establishing more stringent criteria that instruments must meet to be considered Additional Tier 1 Capital (primarily noncumulative perpetual preferred stock that meets certain requirements) and Tier 2 Capital (primarily other types of preferred stock, subordinated debt and the allowance for loan losses, subject to limitations). A number of instruments that qualified as Tier 1 Capital under Basel I do not qualify, or their qualifications changed. For example, noncumulative perpetual preferred stock, which qualified as simple Tier 1 Capital under Basel I, does not qualify as Common Equity Tier 1 Capital, but qualifies as Additional Tier 1 Capital. The Basel III Rule also constrained the inclusion of minority interests, mortgage-servicing assets, and deferred tax assets in capital and requires deductions from Common Equity Tier 1 Capital in the event that such assets exceed a certain percentage of a banking institution’s Common Equity Tier 1 Capital. A minimum leverage ratio of Tier 1 Capital to total quarterly average assets equal to 4 percent in all circumstances. In addition, institutions that seek the freedom to make capital distributions (including for dividends and repurchases of stock) and pay discretionary bonuses to executive officers without restriction must also maintain 2.5 percent in Common Equity Tier 1 Capital attributable to a capital conservation buffer being phased in over three years beginning in 2016 (as of January 1, 2018, it had phased in to 1.875 percent). The purpose of the conservation buffer is to ensure that banking institutions maintain a buffer of capital that can be used to absorb losses during periods of financial and economic stress. Factoring in the fully phased-in conservation buffer increases the minimum ratios depicted above to 7 percent for Common Equity Tier 1 Capital, 8.5 percent for Tier 1 Capital and 10.5 percent for Total Capital. Banking organizations (except for large, internationally active banking organizations) became subject to the new rules on January 1, 2015. However, there are separate phase-in/phase-out periods for: (i) the capital conservation buffer; (ii) regulatory capital adjustments and deductions; (iii) nonqualifying capital instruments; and (iv) changes to the prompt corrective action rules discussed below. The phase-in periods commenced on January 1, 2016 and extend until January 1, 2019. Well-Capitalized Requirements. The ratios described above are minimum standards in order for banking organizations to be considered “adequately capitalized.” Bank regulatory agencies uniformly encourage banks to hold more capital and be “well-capitalized” and, to that end, federal law and regulations provide various incentives for banking organizations to maintain regulatory capital at levels in excess of minimum regulatory requirements. For example, a banking organization that is well-capitalized may: (i) qualify for exemptions from prior notice or application requirements otherwise applicable to certain types of activities; (ii) qualify for expedited processing of other required notices or applications; and (iii) accept, roll-over or renew brokered deposits. Higher capital levels could also be required if warranted by the particular circumstances or risk profiles of individual banking organizations. For example, the Federal Reserve’s capital guidelines contemplate that additional capital may be required to take adequate account of, among other things, interest rate risk, or the risks posed by concentrations of credit, nontraditional activities or securities trading activities. Further, any banking organization experiencing or anticipating significant growth would be expected to maintain capital ratios, including tangible capital positions (i.e., Tier 1 Capital less all intangible assets), well above the minimum levels. A leverage ratio of Tier 1 Capital to total adjusted average quarterly assets of 5 percent or greater. As of December 31, 2017: (i) West Bank was not subject to a directive from the FDIC to increase its capital, and (ii) West Bank was well-capitalized, as defined by FDIC regulations. As of December 31, 2017, the Company had regulatory capital in excess of the Federal Reserve’s requirements and met the fully phased-in Basel III Rule requirements. Prompt Corrective Action. An FDIC-insured institution’s capital plays an important role in connection with regulatory enforcement as well. Federal law provides the federal banking regulators with broad power to take prompt corrective action to resolve the problems of undercapitalized institutions. The extent of the regulators’ powers depends on whether the institution in question is “adequately capitalized,” “undercapitalized,” “significantly undercapitalized” or “critically undercapitalized,” in each case as defined by regulation. Depending upon the capital category to which an institution is assigned, the regulators’ corrective powers include: (i) requiring the institution to submit a capital restoration plan; (ii) limiting the institution’s asset growth and restricting its activities; (iii) requiring the institution to issue additional capital stock (including additional voting stock) or to sell itself; (iv) restricting transactions between the institution and its affiliates; (v) restricting the interest rates that the institution may pay on deposits; (vi) ordering a new election of directors of the institution; (vii) requiring that senior executive officers or directors be dismissed; (viii) prohibiting the institution from accepting deposits from correspondent banks; (ix) requiring the institution to divest certain subsidiaries; (x) prohibiting the payment of principal or interest on subordinated debt; and (xi) ultimately, appointing a receiver for the institution. General. The Company, as the sole stockholder of West Bank, is a bank holding company that has elected financial holding company status. As a financial holding company, we are registered with, and subject to regulation by, the Federal Reserve under the BHCA. We are legally obligated to act as a source of financial and managerial strength to West Bank and to commit resources to support West Bank in circumstances where we might not otherwise do so. Under the BHCA, we are subject to periodic examination by the Federal Reserve and are required to file with the Federal Reserve periodic reports of our operations and such additional information regarding us and West Bank as the Federal Reserve may require. Acquisitions, Activities and Change in Control. The primary purpose of a bank holding company is to control and manage banks. The BHCA generally requires the prior approval of the Federal Reserve for any merger involving a bank holding company or any acquisition by a bank holding company of another bank or bank holding company. Subject to certain conditions (including deposit concentration limits established by the BHCA), the Federal Reserve may allow a bank holding company to acquire banks located in any state of the United States. In approving interstate acquisitions, the Federal Reserve is required to give effect to applicable state law limitations on the aggregate amount of deposits that may be held by the acquiring bank holding company and its FDIC-insured institution affiliates in the state in which the target bank is located (provided that those limits do not discriminate against out-of-state institutions or their holding companies) and state laws that require that the target bank have been in existence for a minimum period of time (not to exceed five years) before being acquired by an out-of-state bank holding company. Furthermore, in accordance with the Dodd-Frank Act, bank holding companies must be well-capitalized and well-managed in order to effect interstate mergers or acquisitions. For a discussion of the capital requirements, see “—Regulatory Emphasis on Capital” above. The BHCA generally prohibits the Company from acquiring direct or indirect ownership or control of more than five percent of the voting shares of any company that is not a bank and from engaging in any business other than that of banking, managing and controlling banks or furnishing services to banks and their subsidiaries. This general prohibition is subject to a number of exceptions. The principal exception allows bank holding companies to engage in, and to own shares of companies engaged in, certain businesses found by the Federal Reserve prior to November 11, 1999 to be “so closely related to banking ... as to be a proper incident thereto.” This authority would permit us to engage in a variety of banking-related businesses, including the ownership and operation of a savings association, or any entity engaged in consumer finance, equipment leasing, the operation of a computer service bureau (including software development) and mortgage banking and brokerage services. The BHCA does not place territorial restrictions on the domestic activities of nonbank subsidiaries of bank holding companies. Additionally, bank holding companies that meet certain eligibility requirements prescribed by the BHCA and elect to operate as financial holding companies may engage in, or own shares in companies engaged in, a wider range of nonbanking activities, including securities and insurance underwriting and sales, merchant banking and any other activity that the Federal Reserve, in consultation with the Secretary of the Treasury, determines by regulation or order is financial in nature or incidental to any such financial activity or that the Federal Reserve determines by order to be complementary to any such financial activity and does not pose a substantial risk to the safety or soundness of FDIC-insured institutions or the financial system generally. In the third quarter of 2016, we elected to operate as a financial holding company. In order to maintain our status as a financial holding company, both the Company and West Bank must be well-capitalized, well-managed, and have at least a satisfactory Community Reinvestment Act (CRA) rating. If the Federal Reserve determines that we are not well-capitalized or well-managed, we will have a period of time in which to achieve compliance, but during the period of noncompliance, the Federal Reserve may place any limitations on us it believes to be appropriate. Furthermore, if the Federal Reserve determines that West Bank has not received a satisfactory CRA rating, we will not be able to commence any new financial activities or acquire a company that engages in such activities. As of December 31, 2017, we retained our election as a financial holding company, but we have not engaged in any activity and did not own any assets for which a financial holding company designation was required. The election affords the ability to respond more quickly to market developments and opportunities. Federal law also prohibits any person or company from acquiring “control” of an FDIC-insured depository institution or its holding company without prior notice to the appropriate federal bank regulator. Control is conclusively presumed to exist upon the acquisition of 25 percent or more of the outstanding voting securities of a bank or bank holding company, but may arise under certain circumstances between 10 percent and 24.99 percent ownership. Capital Requirements. Bank holding companies are required to maintain capital in accordance with Federal Reserve capital adequacy requirements. For a discussion of capital requirements, see “—Regulatory Emphasis on Capital” above. Dividend Payments. Our ability to pay dividends to our stockholders may be affected by both general corporate law considerations and policies of the Federal Reserve applicable to bank holding companies. As an Iowa corporation, we are subject to the limitations of Iowa law, which allows us to pay dividends unless, after such dividend, (i) we would not be able to pay our debts as they become due in the usual course of business or (ii) our total assets would be less than the sum of our total liabilities plus any amount that would be needed if we were to be dissolved at the time of the dividend payment, to satisfy the preferential rights upon dissolution of stockholders whose rights are superior to the rights of the stockholders receiving the distribution. As a general matter, the Federal Reserve has indicated that the board of directors of a bank holding company should eliminate, defer or significantly reduce dividends to stockholders if: (i) the company’s net income available to stockholders for the past four quarters, net of dividends previously paid during that period, is not sufficient to fully fund the dividends; (ii) the prospective rate of earnings retention is inconsistent with the company’s capital needs and overall current and prospective financial condition; or (iii) the company will not meet, or is in danger of not meeting, its minimum regulatory capital adequacy ratios. The Federal Reserve also possesses enforcement powers over bank holding companies and their nonbank subsidiaries to prevent or remedy actions that represent unsafe or unsound practices or violations of applicable statutes and regulations. Among these powers is the ability to proscribe the payment of dividends by banks and bank holding companies. In addition, under the Basel III Rule, institutions that seek the freedom to pay dividends will have to maintain 2.5 percent in Common Equity Tier 1 Capital attributable to the capital conservation buffer to be phased in over three years beginning in 2016. See “—Regulatory Emphasis on Capital” above. The interagency guidance recognized three core principles: Effective incentive plans should: (i) provide employees incentives that appropriately balance risk and reward; (ii) be compatible with effective controls and risk-management; and (iii) be supported by strong corporate governance, including active and effective oversight by the organization’s board of directors. Much of the guidance addresses large banking organizations and, because of the size and complexity of their operations, the regulators expect those organizations to maintain systematic and formalized policies, procedures, and systems for ensuring that the incentive compensation arrangements for all executive and non-executive employees covered by this guidance are identified and reviewed, and appropriately balance risks and rewards. Smaller banking organizations, like the Company, that use incentive compensation arrangements are expected to be less extensive, formalized, and detailed than those of the larger banks. Section 956 of the Dodd-Frank Act required the banking agencies, the National Credit Union Administration, the SEC and the Federal Housing Finance Agency to jointly prescribe regulations that prohibit types of incentive-based compensation that encourage inappropriate risk taking and to disclose certain information regarding such plans. On June 10, 2016, the agencies released an updated proposed rule for comment. Section 956 will only apply to banking organizations with assets of greater than $1 billion. We have consolidated assets greater than $1 billion and less than $50 billion and are considered a Level 3 banking organization under the proposed rules. The proposed rules contain mostly general principles and reporting requirements for Level 3 institutions, so there are no specific prescriptions or limits, deferral requirements or claw-back mandates. Risk management and controls are required, as is board or committee level approval and oversight. Management expects to review its incentive plans in light of the proposed rulemaking and guidance and implement policies and procedures that mitigate unreasonable risk. As of December 31, 2017, these rules remain in proposed form. Federal Securities Regulation. Our common stock is registered with the SEC under the Securities Exchange Act of 1934, as amended (Exchange Act). Consequently, we are subject to the information, proxy solicitation, insider trading and other restrictions and requirements of the SEC under the Exchange Act. Corporate Governance. The Dodd-Frank Act addressed many investor protection, corporate governance and executive compensation matters that will affect most U.S. publicly traded companies. The Dodd-Frank Act increased stockholder influence over boards of directors by requiring companies to give stockholders a nonbinding vote on executive compensation and so-called “golden parachute” payments, and authorizing the SEC to promulgate rules that would allow stockholders to nominate and solicit voters for their own candidates using a company’s proxy materials. The legislation also directed the Federal Reserve to promulgate rules prohibiting excessive compensation paid to executives of bank holding companies, regardless of whether such companies are publicly traded. General. West Bank is an Iowa-chartered bank. The deposit accounts of West Bank are insured by the FDIC’s Deposit Insurance Fund (DIF) to the maximum extent provided under federal law and FDIC regulations, currently $250,000 per insured depositor category. As an Iowa-chartered FDIC-insured bank, West Bank is subject to the examination, supervision, reporting and enforcement requirements of the Iowa Division of Banking, the chartering authority for Iowa banks, and the FDIC, designated by federal law as the primary federal regulator of insured state banks that, like West Bank, are not members of the Federal Reserve System (nonmember banks). Deposit Insurance. As an FDIC-insured institution, West Bank is required to pay deposit insurance premium assessments to the FDIC. The FDIC has adopted a risk-based assessment system whereby FDIC-insured institutions pay insurance premiums at rates based on their risk classification. For institutions, like West Bank, that are not considered large and highly complex banking organizations, assessments are now based on examination ratings and financial ratios. The total base assessment rates currently range from 1.5 basis points to 30 basis points. At least semi-annually, the FDIC updates its loss and income projections for the DIF and, if needed, increases or decreases the assessment rates, following notice and comment on proposed rulemaking. The assessment base against which an FDIC-insured institution’s deposit insurance premiums paid to the DIF are calculated is based on its average consolidated total assets less its average tangible equity. This method shifts the burden of deposit insurance premiums toward those large depository institutions that rely on funding sources other than U.S. deposits. The reserve ratio is the FDIC insurance fund balance divided by estimated insured deposits. The Dodd-Frank Act altered the minimum reserve ratio of the DIF, increasing the minimum from 1.15 percent to 1.35 percent of the estimated amount of total insured deposits, and eliminating the requirement that the FDIC pay dividends to FDIC-insured institutions when the reserve ratio exceeds certain thresholds. The reserve ratio reached 1.28 percent as of September 30, 2017 (most recent available.) If the reserve ratio does not reach 1.35 percent by December 31, 2018 (provided it is at least 1.15 percent), the FDIC will impose a shortfall assessment on March 31, 2019 on insured depository institutions with total consolidated assets of $10 billion or more. The FDIC will provide assessment credits to insured depository institutions, like West Bank, with total consolidated assets of less than $10 billion for the portion of their regular assessments that contribute to growth in the reserve ratio between 1.15 percent and 1.35 percent. The FDIC will apply the credits each quarter that the reserve ratio is at least 1.38 percent to offset the regular deposit insurance assessments of institutions with credits. FICO Assessments. In addition to paying basic deposit insurance assessments, FDIC-insured institutions must pay Financing Corporation (FICO) assessments. FICO is a mixed-ownership governmental corporation chartered by the former Federal Home Loan Bank Board pursuant to the Competitive Equality Banking Act of 1987 to function as a financing vehicle for the recapitalization of the former Federal Savings and Loan Insurance Corporation. FICO issued 30-year noncallable bonds of approximately $8.1 billion that mature in 2017 through 2019. FICO’s authority to issue bonds ended on December 12, 1991. Since 1996, federal legislation has required that all FDIC-insured institutions pay assessments to cover interest payments on FICO’s outstanding obligations. The FICO assessment rate is adjusted quarterly and for the fourth quarter of 2017 was 0.54 basis points (54 cents per $100 dollars of assessable deposits). Supervisory Assessments. All Iowa banks are required to pay supervisory assessments to the Iowa Division of Banking to fund the operations of that agency. The amount of the assessment is calculated on the basis of West Bank’s total assets. During the year ended December 31, 2017, West Bank paid supervisory assessments to the Iowa Division of Banking totaling approximately $122,000. Capital Requirements. Banks are generally required to maintain capital levels in excess of other businesses. For a discussion of capital requirements, see “—Regulatory Emphasis on Capital” above. Liquidity Requirements. Liquidity is a measure of the ability and ease with which bank assets may be converted to cash. Liquid assets are those that can be converted to cash quickly if needed to meet financial obligations. To remain viable, FDIC-insured institutions must have enough liquid assets to meet their near-term obligations, such as withdrawals by depositors. In addition to liquidity guidelines already in place, the U.S. bank regulatory agencies implemented the Basel III Liquidity Coverage Ratios (LCR) in September 2014, which require large financial firms to hold levels of liquid assets sufficient to protect against constraints on their funding during times of financial turmoil. While the LCR only applies to the largest banking organizations in the country, certain elements are expected to filter down to all FDIC-insured institutions. Stress Testing. A stress test is an analysis or simulation designed to determine the ability of a given FDIC-insured institution to deal with an economic crisis. In October 2012, U.S. bank regulators unveiled new rules mandated by the Dodd-Frank Act that require the largest U.S. banks to undergo stress tests twice per year, once internally and once conducted by the regulators. Stress tests are not required for banks with less than $10 billion in assets; however, the FDIC now recommends stress testing as a means to identify and quantify loan portfolio risk, and West Bank is conducting quarterly commercial real estate portfolio stress testing. Dividend Payments. The primary source of funds for the Company is dividends from West Bank. Under the Iowa Banking Act, Iowa-chartered banks generally may pay dividends only out of undivided profits. The Iowa Division of Banking may restrict the declaration or payment of a dividend by an Iowa-chartered bank, such as West Bank. The payment of dividends by any FDIC-insured institution is affected by the requirement to maintain adequate capital pursuant to applicable capital adequacy guidelines and regulations, and an FDIC-insured institution generally is prohibited from paying any dividends if, following payment thereof, the institution would be undercapitalized. As described above, West Bank exceeded its capital requirements under applicable guidelines as of December 31, 2017. Notwithstanding the availability of funds for dividends, however, the FDIC and the Iowa Division of Banking may prohibit the payment of dividends by West Bank if either or both determine such payment would constitute an unsafe or unsound practice. In addition, under the Basel III Rule, institutions that seek the freedom to pay dividends will have to maintain 2.5 percent in Common Equity Tier 1 Capital attributable to the capital conservation buffer to be phased in over three years beginning in 2016. See “—Regulatory Emphasis on Capital” above. State Bank Investments and Activities. West Bank is permitted to make investments and engage in activities directly or through subsidiaries as authorized by Iowa law. However, under federal law and FDIC regulations, FDIC-insured state banks are prohibited, subject to certain exceptions, from making or retaining equity investments of a type, or in an amount, that are not permissible for a national bank. Federal law and FDIC regulations also prohibit FDIC-insured state banks and their subsidiaries, subject to certain exceptions, from engaging as principal in any activity that is not permitted for a national bank unless West Bank meets, and continues to meet, its minimum regulatory capital requirements and the FDIC determines that the activity would not pose a significant risk to the DIF. These restrictions have not had, and are not currently expected to have, a material impact on the operations of West Bank. Insider Transactions. West Bank is subject to certain restrictions imposed by federal law on “covered transactions” between West Bank and its “affiliates.” The Company is an affiliate of West Bank for purposes of these restrictions, and covered transactions subject to the restrictions include extensions of credit to the Company, investments in the stock or other securities of the Company, and the acceptance of the stock or other securities of the Company as collateral for loans made by West Bank. The Dodd-Frank Act enhanced the requirements for certain transactions with affiliates, including an expansion of the definition of “covered transactions” and an increase in the amount of time for which collateral requirements regarding covered transactions must be maintained. Certain limitations and reporting requirements are also placed on extensions of credit by West Bank to its directors and officers, to directors and officers of the Company and its subsidiaries, to principal stockholders of the Company and to “related interests” of such directors, officers and principal stockholders. In addition, federal law and regulations may affect the terms upon which any person who is a director or officer of the Company or West Bank, or a principal stockholder of the Company, may obtain credit from banks with which West Bank maintains a correspondent relationship. In general, the safety and soundness guidelines prescribe the goals to be achieved in each area, and each institution is responsible for establishing its own procedures to achieve those goals. If an institution fails to comply with any of the standards set forth in the guidelines, the FDIC-insured institution’s primary federal regulator may require the institution to submit a plan for achieving and maintaining compliance. If an FDIC-insured institution fails to submit an acceptable compliance plan, or fails in any material respect to implement a compliance plan that has been accepted by its primary federal regulator, the regulator is required to issue an order directing the institution to cure the deficiency. Until the deficiency cited in the regulator’s order is cured, the regulator may restrict the FDIC-insured institution’s rate of growth, require the FDIC-insured institution to increase its capital, restrict the rates the institution pays on deposits, or require the institution to take any action the regulator deems appropriate under the circumstances. Noncompliance with the standards established by the safety and soundness guidelines may also constitute grounds for other enforcement action by the federal bank regulatory agencies, including cease and desist orders and civil money penalty assessments. During the past decade, the bank regulatory agencies have increasingly emphasized the importance of sound risk management processes and strong internal controls when evaluating the activities of the FDIC-insured institutions they supervise. Properly managing risks has been identified as critical to the conduct of safe and sound banking activities and has become even more important as new technologies, product innovation, and the size and speed of financial transactions have changed the nature of banking markets. The agencies have identified a spectrum of risks facing a banking institution including, but not limited to, credit, market, liquidity, operational, legal and reputational risk. In particular, recent regulatory pronouncements have focused on operational risk, which arises from the potential that inadequate information systems, operational problems, breaches in internal controls, fraud, or unforeseen catastrophes will result in unexpected losses. New products and services, third-party risk and cybersecurity are critical sources of operational risk that FDIC-insured institutions must address in the current environment. West Bank is expected to have active board and senior management oversight; adequate policies, procedures and limits; adequate risk measurement, monitoring and management information systems; and comprehensive internal controls. Branching Authority. Iowa banks, such as West Bank, have the authority under Iowa law to establish branches anywhere in the State of Iowa, subject to receipt of all required regulatory approvals. Federal law permits state and national banks to merge with banks in other states subject to: (i) regulatory approval; (ii) federal and state deposit concentration limits; and (iii) state law limitations requiring the merging bank to have been in existence for a minimum period of time (not to exceed five years) prior to the merger. The establishment of new interstate branches has historically been permitted only in those states the laws of which expressly authorize such expansion. The Dodd-Frank Act permits well-capitalized and well-managed banks to establish new interstate branches or the acquisition of individual branches of a bank in another state (rather than the acquisition of an out-of-state bank in its entirety) without impediments. Transaction Account Reserves. Federal Reserve regulations require FDIC-insured institutions to maintain reserves against their transaction accounts (primarily NOW and regular checking accounts). For 2018, the first $16 million of otherwise reservable balances are exempt from reserves and have a zero percent reserve requirement; for transaction accounts aggregating more than $16 million to $122.3 million, the reserve requirement is 3 percent of total transaction accounts; and for net transaction accounts in excess of $122.3 million, the reserve requirement is 3 percent up to $122.3 million plus 10 percent of the aggregate amount of total transaction accounts in excess of $122.3 million. These reserve requirements are subject to annual adjustment by the Federal Reserve. Community Reinvestment Act Requirements. The Community Reinvestment Act requires West Bank to have a continuing and affirmative obligation in a safe and sound manner to help meet the credit needs of its entire community, including low- and moderate-income neighborhoods. Federal regulators regularly assess West Bank’s record of meeting the credit needs of its communities. Applications for additional acquisitions would be affected by the evaluation of West Bank’s effectiveness in meeting its Community Reinvestment Act requirements. Anti-Money Laundering. The Uniting and Strengthening America by Providing Appropriate Tools Required to Intercept and Obstruct Terrorism Act of 2001 (USA PATRIOT Act) is designed to deny terrorists and criminals the ability to obtain access to the U.S. financial system and has significant implications for FDIC-insured institutions, brokers, dealers and other businesses involved in the transfer of money. The USA PATRIOT Act mandates financial services companies to have policies and procedures with respect to measures designed to address any or all of the following matters: (i) customer identification programs; (ii) money laundering; (iii) terrorist financing; (iv) identifying and reporting suspicious activities and currency transactions; (v) currency crimes; and (vi) cooperation between FDIC-insured institutions and law enforcement authorities. Concentrations in Commercial Real Estate. Concentration risk exists when FDIC-insured institutions deploy too many assets to any one industry or segment. A concentration in commercial real estate is one example of regulatory concern. The interagency Concentrations in Commercial Real Estate Lending, Sound Risk Management Practices guidance (CRE Guidance) provides supervisory criteria, including the following numerical indicators, to assist bank examiners in identifying banks with potentially significant commercial real estate loan concentrations that may warrant greater supervisory scrutiny: (i) commercial real estate loans exceeding 300 percent of capital and increasing 50 percent or more in the preceding three years; or (ii) construction and land development loans exceeding 100 percent of capital. The CRE Guidance does not limit banks’ levels of commercial real estate lending activities, but rather guides institutions in developing risk management practices and levels of capital that are commensurate with the level and nature of their commercial real estate concentrations. On December 18, 2015, the federal banking agencies issued a statement to reinforce prudent risk-management practices related to CRE lending, having observed substantial growth in many CRE asset and lending markets, increased competitive pressures, rising CRE concentrations in banks, and an easing of CRE underwriting standards. The federal bank agencies reminded FDIC-insured institutions to maintain underwriting discipline and exercise prudent risk-management practices to identify, measure, monitor and manage the risks arising from CRE lending. In addition, FDIC-insured institutions must maintain capital commensurate with the level and nature of their CRE concentration risk. Based on West Bank’s loan portfolio as of December 31, 2017, it exceeded the 300 percent guideline for commercial real estate loans. Additional monitoring processes have been implemented to manage this increased risk. Consumer Financial Services. The historical structure of federal consumer protection regulation applicable to all providers of consumer financial products and services changed significantly on July 21, 2011, when the CFPB commenced operations to supervise and enforce consumer protection laws. The CFPB has broad rulemaking authority for a wide range of consumer protection laws that apply to all providers of consumer products and services, including West Bank, as well as the authority to prohibit “unfair, deceptive or abusive” acts and practices. The CFPB has examination and enforcement authority over providers with more than $10 billion in assets. FDIC-insured institutions with $10 billion or less in assets, like West Bank, continue to be examined by their applicable bank regulators. We do not currently expect the CFPB’s rules to have a significant impact on our operations, except for higher compliance costs. The principal executive offices of the Company are located at 1601 22nd Street, West Des Moines, Iowa 50266. The Company’s telephone number is (515) 222-2300, and the internet address is www.westbankstrong.com. Copies of the Company’s annual reports on Form 10-K, quarterly reports on Form 10-Q, current reports on Form 8-K, and any amendments thereto are available for viewing or downloading free of charge from the Investor Relations section of the Company’s website as soon as reasonably practicable after the documents are filed with or furnished to the SEC. Copies of the Company’s filings with the SEC are also available from the SEC’s website (www.sec.gov) free of charge. West Bancorporation’s business is conducted almost exclusively through West Bank. West Bancorporation and West Bank are subject to many of the common risks that challenge publicly traded, regulated financial institutions. An investment in West Bancorporation’s common stock is also subject to the following specific risks. In addition to the risks and uncertainties described below, other risks and uncertainties not currently known to us or that we currently deem to be immaterial also may materially and adversely affect our business, financial condition and results of operations. We must effectively manage the credit risks of our loan portfolio. The largest component of West Bank’s income is interest received on loans. Our business depends on the creditworthiness of our customers. There are risks inherent in making loans, including risks of nonpayment, risks resulting from uncertainties of the future value of collateral and risks resulting from changes in economic and industry conditions. We attempt to reduce our credit risk through prudent loan application, underwriting and approval procedures, including internal loan reviews before and after proceeds have been disbursed, careful monitoring of the concentration of our loans within specific industries, and collateral and guarantee requirements. These procedures cannot, however, be expected to completely eliminate our credit risks, and we can make no guarantees concerning the strength of our loan portfolio. Our loan portfolio includes commercial loans, which involve risks specific to commercial borrowers. West Bank’s loan portfolio includes a significant amount of commercial real estate loans, construction and land development loans, commercial lines of credit and commercial term loans. West Bank’s typical commercial borrower is a small- or medium-sized, privately owned Iowa or Minnesota business entity. Commercial loans often have large balances, and repayment usually depends on the borrowers’ successful business operations. Commercial loans also are generally are not fully repaid over the loan period and thus may require refinancing or a large payoff at maturity. If the general economy turns downward, commercial borrowers may not be able to repay their loans, and the value of their assets, which are usually pledged as collateral, may decrease rapidly and significantly. Also, when credit markets tighten due to adverse developments in specific markets or the general economy, opportunities for refinancing may become more expensive or unavailable, resulting in loan defaults. Our loan portfolio includes commercial real estate loans, which involve risks specific to real estate value. Commercial real estate loans were a significant portion of our total loan portfolio as of December 31, 2017. The market value of real estate can fluctuate significantly in a short period of time as a result of market conditions in the geographic area in which the real estate is located. Adverse developments affecting real estate values in one or more of our markets could increase the credit risk associated with our loan portfolio. Additionally, commercial real estate lending typically involves higher loan principal amounts, and repayment of the loans is generally dependent, in large part, on sufficient income from the properties securing the loans to cover operating expenses and debt service. Economic events or governmental regulations outside of the control of the borrower or lender could negatively impact the future cash flows and market values of the affected properties. If the loans that are collateralized by real estate become troubled and the value of the real estate has been significantly impaired, then we may not be able to recover the full contractual amount of principal and interest that we anticipated at the time of originating the loans, which could cause us to charge off all or a portion of the loans. This could lead to an increased provision for loan losses and adversely affect our operating results and financial condition. The level of our commercial real estate loan portfolio may subject us to additional regulatory scrutiny. The federal banking regulators have promulgated joint guidance on sound risk management practices for financial institutions with concentrations in commercial real estate lending. Under this guidance, a financial institution that, like West Bank, is actively involved in commercial real estate lending should perform a risk assessment to identify concentrations. A financial institution may have a concentration in commercial real estate lending if, among other factors (i) total reported loans for construction, land development, and other land represent 100 percent or more of total capital, or (ii) total reported loans secured by multifamily and non-farm residential properties, loans for construction, land development and other land, and loans otherwise sensitive to the general commercial real estate market, including loans to commercial real estate related entities, represent 300 percent or more of total capital. Based on these criteria, West Bank had concentrations of 87 percent and 377 percent, respectively, as of December 31, 2017. The purpose of the guidance is to assist banks in developing risk management practices and capital levels commensurate with the level and nature of commercial real estate concentrations. The guidance states that management should employ heightened risk management practices, including board and management oversight, strategic planning, development of underwriting standards, and risk assessment and monitoring through market analysis and stress testing. West Bank believes that its current risk management processes adequately address the regulatory guidance; however, there can be no guarantee of the effectiveness of the risk management processes on an ongoing basis. We are subject to environmental liability risk associated with real estate collateral securing our loans. A significant portion of our loan portfolio is secured by real property. Under certain circumstances, we may take title to the real property collateral through foreclosure or other means. As the titleholder of the property, we may be responsible for environmental risks, such as hazardous materials, which attach to the property. For these reasons, prior to extending credit, we have an environmental risk assessment program to identify any known environmental risks associated with the real property that will secure our loans. In addition, we routinely inspect properties following the taking of title. When environmental risks are found, environmental laws and regulations may prescribe our approach to remediation. As a result, while we have ownership of a property, we may incur substantial expense and bear potential liability for any damages caused. The environmental risks may also materially reduce the property’s value or limit our ability to use or sell the property. We also cannot guarantee that our environmental risk assessment will detect all environmental issues relating to a property, which could subject us to additional liability. Our allowance for loan losses may be insufficient to absorb potential losses in our loan portfolio. We maintain an allowance for loan losses at a level we believe adequate to absorb probable losses inherent in our existing loan portfolio. The level of the allowance reflects management’s continuing evaluation of industry concentrations; specific credit risks; credit loss experience; current loan portfolio quality; present economic, political and regulatory conditions; and unidentified losses inherent in the current loan portfolio. Determination of the allowance is inherently subjective as it requires significant estimates and management’s judgment of credit risks and future trends, all of which may undergo material changes. Deterioration in economic conditions affecting borrowers, new information regarding existing loans, identification of additional problem loans and other factors, both within and outside of our control, may require an increase in the allowance for loan losses. In addition, bank regulatory agencies periodically review our allowance and may require an increase in the provision for loan losses or the recognition of additional loan charge-offs, based on judgments different from those of management. Also, if charge-offs in future periods exceed the allowance for loan losses, we will need additional provisions to increase the allowance. Any increases in provisions will result in a decrease in net income and capital and may have a material adverse effect on our financial condition and results of operations. A new accounting standard could require us to increase our allowance for loan losses and may have a material adverse effect on our financial condition and results of operations. The FASB issued a new accounting standard that will be effective for the Company for the fiscal year beginning January 1, 2020. This standard, referred to as Current Expected Credit Loss (CECL), will require financial institutions to determine periodic estimates of lifetime expected credit losses on loans, and recognize the expected credit losses as allowances for loan losses. This will change the current method of providing for loan losses that are probable, and will likely require us to increase our allowance for loan losses and to greatly increase the types of data we will need to collect and analyze to determine the appropriate level of the allowance for loan losses. Any increase in our allowance for loan losses or expenses incurred to determine the appropriate level of the allowance for loan losses will result in a decrease in net income and capital and may have a material adverse impact on our financial condition and results of operations. Moreover, the CECL model may create more volatility in our level of allowance for loan losses and could result in the need for additional capital. Our accounting policies and methods are the basis for how we report our financial condition and results of operations, and they may require management to make estimates about matters that are inherently uncertain. Our accounting policies and methods are fundamental to how we record and report our financial condition and results of operations. Our management must exercise judgment in selecting and applying many of these accounting policies and methods in order to ensure they comply with U.S. generally accepted accounting principles (GAAP) and reflect management’s judgment as to the most appropriate manner in which to record and report our financial condition and results of operations. In some cases, management must select the accounting policy or method to apply from two or more alternatives, any of which might be reasonable under the circumstances. The application of that chosen accounting policy or method might result in us reporting different amounts than would have been reported under a different alternative. If management’s estimates or assumptions are incorrect, the Company may experience a material loss. From time to time, the FASB and the SEC change the financial accounting and reporting standards or the interpretation of those standards that govern the preparation of our financial statements. These changes are beyond our control, can be difficult to predict and could have a materially adverse impact on our financial condition and results of operations. If a significant portion of any unrealized losses in our portfolio of investment securities were to become other than temporarily impaired with credit losses, we would recognize a material charge to our earnings, and our capital ratios would be adversely impacted. Factors beyond our control can significantly influence the fair value of securities in our portfolio and can cause potential adverse changes to the fair value of those securities. These factors include, but are not limited to, changes in interest rates, rating agency downgrades of the securities, defaults by the issuer or individual mortgagors with respect to the underlying securities, and instability in the credit markets. Any of the foregoing factors could cause an other than temporary impairment (OTTI) in future periods and result in realized losses. We analyze our investment securities quarterly to determine whether, in the opinion of management, any of the securities have OTTI. To the extent that any portion of the unrealized losses in our portfolio of investment securities is determined to have OTTI and is credit-loss related, we will recognize a charge to our earnings in the quarter during which such determination is made, and our capital ratios will be adversely impacted. Generally, a fixed income security is determined to have OTTI when it appears unlikely that we will receive all the principal and interest due in accordance with the original terms of the investment. In addition to credit losses, losses are recognized for a security with an unrealized loss if the Company has the intent to sell the security or if it is more likely than not that the Company will be required to sell the security before collection of the principal amount. We are subject to liquidity risks. West Bank maintains liquidity primarily through customer deposits and other short-term funding sources, including advances from the Federal Home Loan Bank (FHLB) and purchased federal funds. If economic influences change so that we do not have access to short-term credit, or our depositors withdraw a substantial amount of their funds for other uses, West Bank might experience liquidity issues. Our efforts to monitor and manage liquidity risk may not be successful or sufficient to deal with dramatic or unanticipated reductions in our liquidity. If this were to occur and additional debt is needed for liquidity purposes in the future, there can be no assurance that such debt would be available or, if available, would be on favorable terms. In such events, our cost of funds may increase, thereby reducing our net interest income, or we may need to sell a portion of our investment portfolio, which, depending upon market conditions, could result in the Company or West Bank realizing losses. Although we believe West Bank’s current sources of funds are adequate for its liquidity needs, there can be no assurance in this regard for the future. The competition for banking and financial services in our market areas is high, which could adversely affect our financial condition and results of operations. We operate in highly competitive markets and face strong competition in originating loans, seeking deposits and offering our other services. We compete in making loans, attracting deposits, and recruiting and retaining talented employees. The Des Moines metropolitan market area, in particular, has attracted many new financial institutions within the last two decades. We also compete with nonbank financial service providers, many of which are not subject to the same regulatory restrictions that we are and may be able to compete more effectively as a result. Customer loyalty can be influenced by a competitor’s new products, especially if those offerings are priced lower than our products. Some of our competitors may also be better able to attract customers because they provide products and services over a larger geographic area than we serve. This competitive climate can make it more difficult to establish and maintain relationships with new and existing customers, can lower the rate that we are able to charge on loans, and can affect our charges for other services. Our growth and profitability depend on our continued ability to compete effectively within our market, and our inability to do so could have a material adverse effect on our financial condition and results of operations. Technology and other changes are allowing customers to complete financial transactions using nonbanks that historically have involved banks at one or both ends of the transaction. For example, customers can now pay bills and transfer funds directly without going through a bank. The process of eliminating banks as intermediaries, known as disintermediation, could result in the loss of fee income as well as the loss of customer deposits. Loss of customer deposits due to increased competition could increase our funding costs. We rely on bank deposits to be a low cost and stable source of funding. We compete with banks and other financial services companies for deposits. If our competitors raise the rates they pay on deposits, our funding costs may increase, either because we raise our rates to avoid losing deposits or because we lose deposits and must rely on more expensive sources of funding. Higher funding costs could reduce our net interest margin and net interest income and could have a material adverse effect on our financial condition and results of operations. The occurrence of fraudulent activity, breaches or failures of our information security controls or cybersecurity-related incidents could have a material adverse effect on our business, financial condition, results of operations and growth prospects. As a bank, we are susceptible to fraudulent activity, information security breaches and cybersecurity-related incidents that may be committed against us or our clients, which may result in financial losses or increased costs to us or our customers, disclosure or misuse of our information or our client information, misappropriation of assets, privacy breaches against our customers, litigation or damage to our reputation. Such fraudulent activity may take many forms, including check fraud, electronic fraud, wire fraud, phishing, social engineering and other dishonest acts. Information security breaches and cybersecurity-related incidents may include fraudulent or unauthorized access to systems used by us, our customers or third-party vendors, denial or degradation of service attacks, and malware or other cyber-attacks. There continues to be a rise in electronic fraudulent activity, security breaches and cyber-attacks within the financial services industry, especially in the commercial banking sector due to cyber criminals targeting commercial bank accounts. Moreover, in recent periods, several large corporations, including financial institutions and retail companies, have suffered major data breaches, in some cases exposing not only confidential and proprietary corporate information, but also sensitive financial and other personal information of their customers and employees and subjecting them to potential fraudulent activity. Some of our customers may have been affected by these breaches, which could increase their risks of identity theft and other fraudulent activity that could involve their accounts with us. Information pertaining to us and our customers is maintained, and transactions are executed, on networks and systems maintained by us and certain third-party partners, such as our online banking, mobile banking or accounting systems. The secure maintenance and transmission of confidential information, as well as execution of transactions over these systems, are essential to protect us and our customers against fraud and security breaches and to maintain the confidence of our customers. Breaches of information security also may occur through intentional or unintentional acts by those having access to our systems or the confidential information of our customers, including employees. In addition, increases in criminal activity levels and sophistication, advances in computer capabilities, new discoveries, vulnerabilities in third-party technologies (including browsers and operating systems) or other developments could result in a compromise or breach of the technology, processes and controls that we use to prevent fraudulent transactions and to protect data about us, our customers and underlying transactions, as well as the technology used by our customers to access our systems. Our third-party partners’ inability to anticipate, or failure to adequately mitigate, breaches of security could result in a number of negative events, including losses to us or our customers, loss of business or customers, damage to our reputation, the incurrence of additional expenses, disruption to our business, additional regulatory scrutiny or penalties, or our exposure to civil litigation and possible financial liability, any of which could have a material adverse effect on our business, financial condition, results of operations and growth prospects. We depend on information technology and telecommunications systems of third parties, and any systems failures, interruptions or data breaches involving these systems could adversely affect our operations and financial condition. Our business is highly dependent on the successful and uninterrupted functioning of our information technology and telecommunications systems, third-party servicers, accounting systems, mobile and online banking platforms and financial intermediaries. We outsource to third parties many of our major systems, such as data processing and mobile and online banking. The failure of these systems, or the termination of a third-party software license or service agreement on which any of these systems is based, could interrupt our operations. Because our information technology and telecommunications systems interface with and depend on third-party systems, we could experience service denials if demand for such services exceeds capacity or such third-party systems fail or experience interruptions. A system failure or service denial could result in a deterioration of our ability to process loans or gather deposits and provide customer service, compromise our ability to operate effectively, result in potential noncompliance with applicable laws or regulations, damage our reputation, result in a loss of customer business or subject us to additional regulatory scrutiny and possible financial liability, any of which could have a material adverse effect on business, financial condition, results of operations and growth prospects. In addition, failures of third parties to comply with applicable laws and regulations, or fraud or misconduct on the part of employees of any of these third parties, could disrupt our operations or adversely affect our reputation. It may be difficult for us to replace some of our third-party vendors, particularly vendors providing our core banking and information services, in a timely manner if they are unwilling or unable to provide us with these services in the future for any reason, and even if we are able to replace them, it might be at higher cost or result in the loss of customers. Any such events could have a material adverse effect on our business, financial condition, results of operations and growth prospects. Our operations rely heavily on the secure processing, storage and transmission of information and the monitoring of a large number of transactions on a minute-by-minute basis, and even a short interruption in service could have significant consequences. We also interact with and rely on retailers, for whom we process transactions, as well as financial counterparties and regulators. Each of these third parties may be targets of the same types of fraudulent activity, computer break-ins and other cybersecurity breaches described above, and the cybersecurity measures that they maintain to mitigate the risk of such activity may be different than our own and may be inadequate. As a result of financial entities and technology systems becoming more interdependent and complex, a cyber incident, information breach or loss, or technology failure that compromises the systems or data of one or more financial entities could have a material impact on counterparties or other market participants, including ourselves. As a result of the foregoing, our ability to conduct business may be adversely affected by any significant disruptions to us or to third parties with whom we interact. Failure to maintain effective internal controls over financial reporting could impair our ability to accurately and timely report our financial results and could increase the risk of fraud. Effective internal controls over financial reporting are necessary to provide reliable financial reports and prevent fraud. Management believes that our internal controls over financial reporting are currently effective. While management will continue to assess our controls and procedures and take immediate action to remediate any future perceived issues, there can be no guarantee of the effectiveness of these controls and procedures on an ongoing basis. Any failure to maintain an effective internal control environment could impact our ability to report our financial results on an accurate and timely basis, which could result in regulatory actions, loss of investor confidence, and an adverse impact on our business operations and stock price. Damage to our reputation could adversely affect our business. Our business depends upon earning and maintaining the trust and confidence of our customers, stockholders and employees. Damage to our reputation could cause significant harm to our business. Harm to our reputation can arise from numerous sources, including employee misconduct, vendor nonperformance, cybersecurity breaches, compliance failures, litigation or governmental investigations, among other things. In addition, a failure to deliver appropriate standards of service, or a failure or perceived failure to treat customers and clients fairly, can result in customer dissatisfaction, litigation, and heightened regulatory scrutiny, all of which can lead to lost revenue, higher operating costs and harm to our reputation. Adverse publicity about West Bank, whether or not true, may also result in harm to our business. Should any events or circumstances that could undermine our reputation occur, there can be no assurance that any lost revenue from customers opting to move their business to another institution and the additional costs and expenses that we may incur in addressing such issues would not adversely affect our financial condition and results of operations. We are periodically involved in routine litigation incidental to our business. Regardless of whether these claims and legal actions are founded or unfounded, if such legal actions are not resolved in a manner favorable to us, they may result in significant financial liability and/or adversely affect the Company’s reputation. In addition, litigation can be costly. Any financial liability, litigation costs or reputational damage caused by these legal claims could have a material adverse impact on our business, financial condition and results of operations. Financial services institutions are interrelated as a result of trading, clearing, counterparty or other relationships. We have exposure to many different industries and counterparties, and we routinely execute transactions with counterparties in the financial services industry, including brokers and dealers, commercial banks, investment banks and other institutional clients. Many of these transactions expose us to credit risk in the event of default by our counterparty or client. In addition, our credit risk may be exacerbated when the collateral held by us cannot be realized or is liquidated at prices not sufficient to recover the full amount of the loan or derivative exposure due us. There is no assurance that any such losses would not materially and adversely affect our results of operations or earnings. We may experience difficulties in managing our growth. In the future, we may decide to expand into additional communities or attempt to strengthen our position in our current markets through opportunistic acquisitions of all or part of other financial institutions or related businesses that we believe provide a strategic fit with our business, or by opening new branches or loan production offices. To the extent that we undertake acquisitions or new office openings, we are likely to experience the effects of higher operating expense relative to operating income from the new operations, which may have an adverse effect on our overall levels of reported net income, return on average equity and return on average assets. Other effects of engaging in such growth strategies may include potential diversion of our management’s time and attention and general disruption to our business. To the extent that we grow through acquisitions or office openings, we cannot provide assurance that we will be able to adequately or profitably manage such growth. Acquiring other banks and businesses will involve risks similar to those commonly associated with new office openings, but may also involve additional risks. These additional risks include potential exposure to unknown or contingent liabilities of banks and businesses we acquire, exposure to potential asset quality issues of the acquired bank or related business, difficulty and expense of integrating the operations and personnel of banks and businesses we acquire, and the possible loss of key employees and customers of the banks and businesses we acquire. Maintaining or increasing our market share may depend on lowering prices and the adoption of new products and services. Our success depends, in part, on our ability to adapt our products and services to evolving industry standards. There may be increased pressure to provide products and services at lower prices. Lower prices can reduce our net interest margin and revenues from our fee-based products and services. In addition, the widespread adoption of new technologies could require us to make substantial expenditures to modify or adapt our existing products and services. Also, these and other capital investments in our business may not produce expected growth in earnings anticipated at the time of the expenditure. We may not be successful in introducing new products and services, achieving market acceptance of our products and services, or developing and maintaining loyal customers. The loss of the services of any of our senior executive officers or key personnel could cause our business to suffer. Much of our success is due to our ability to attract and retain senior management and key personnel experienced in banking and financial services who are very involved in the communities we currently serve. Our continued success depends to a significant extent upon the continued services of relatively few individuals. In addition, our success depends in significant part upon our senior management’s ability to develop and implement our business strategies. The loss of services of a few of our senior executive officers or key personnel, or the inability to recruit and retain qualified personnel in the future, could have an adverse effect on our business, financial condition or results of operations, at least in the short term. We may be materially and adversely affected by the highly regulated environment in which we operate. We are subject to extensive federal and state regulation, supervision and examination. A more detailed description of the primary federal and state banking laws and regulations that affect us is contained in Item 1 of this Form 10-K in the section captioned “Supervision and Regulation.” Banking regulations are primarily intended to protect depositors’ funds, FDIC funds, customers and the banking system as a whole, rather than our stockholders. These regulations affect our lending practices, capital structure, investment practices, dividend policy and growth, among other things. As a financial holding company, we are subject to extensive regulation and supervision and undergo periodic examinations by our regulators, who have extensive discretion and authority to prevent or remedy unsafe or unsound practices or violations of law by banks and financial holding companies. Failure to comply with applicable laws, regulations or policies could result in sanctions by regulatory agencies, civil monetary penalties and/or damage to our reputation, which could have a material adverse effect on us. Although we have policies and procedures designed to mitigate the risk of any such violations, there can be no assurance that such violations will not occur. Current or proposed regulatory or legislative changes to laws applicable to the financial industry may impact the profitability of our business activities and may change certain of our business practices, including our ability to offer new products, obtain financing, attract deposits, make loans and achieve satisfactory interest spreads, and could expose us to additional costs, including increased compliance costs. These changes also may require us to invest significant management attention and resources to make any necessary changes to operations in order to comply and could therefore also materially and adversely affect our business, financial condition and results of operations. While it is anticipated that the current presidential administration will not increase the regulatory burdens on community banks and may reduce some of the burdens associated with the implementation of the Dodd-Frank Act, the actual impact of regulatory actions of the current administration is impossible to predict with any certainty at this time. Our business is subject to domestic and, to a lesser extent, international economic conditions and other factors, many of which are beyond our control and could materially and adversely affect us. Our financial performance generally, and in particular the ability of customers to pay interest on and repay principal on outstanding loans and the value of collateral securing those loans, as well as demand for loans and other products and services we offer, is highly dependent upon the business environment, not only in the markets where we operate, but also in the states of Iowa and Minnesota, generally, in the United States as a whole, and internationally. A favorable business environment is generally characterized by, among other factors, economic growth, efficient capital markets, low inflation, low unemployment, high business and investor confidence, and strong business earnings. Unfavorable or uncertain economic and market conditions can be caused by declines in economic growth, business activity, or investor or business confidence; limitations on the availability or increases in the cost of credit and capital; increases in inflation or interest rates; high unemployment; natural disasters; or a combination of these or other factors. While economic conditions in our markets, the states of Iowa and Minnesota and the United States have generally improved since the recession, there can be no assurance that this improvement will continue or occur at a meaningful rate. A return of recessionary conditions and/or negative developments in the domestic and international credit markets may significantly affect the markets in which we do business, the value of our loans and investments, and our ongoing operations, costs and profitability. Such conditions could materially and adversely affect us. Monetary policies and regulations of the Federal Reserve could adversely affect our business, financial condition and results of operations. In addition to being affected by general economic conditions, our earnings and growth are affected by the policies of the Federal Reserve. An important function of the Federal Reserve is to regulate the money supply and credit conditions. Among the options available to the Federal Reserve to implement these objectives are open market operations in U.S. government securities, adjustments of the discount rate, and changes in reserve requirements against bank deposits. These monetary policy options are used in varying combinations to influence overall economic growth and the distribution of credit, bank loans, investments and deposits. Their use also affects interest rates charged on loans or paid on deposits. The monetary policies and regulations of the Federal Reserve have had a significant effect on the operating results of commercial banks in the past and are expected to continue to do so in the future. The specific effects of such policies upon our business, financial condition and results of operations cannot be predicted. Earnings in the banking industry, particularly the community bank segment, are substantially dependent on net interest income, which is the difference between interest earned on interest-earning assets (investments and loans) and interest paid on interest-bearing liabilities (deposits and borrowings). Interest rates are sensitive to many factors, including government monetary and fiscal policies and domestic and international economic and political conditions. During the last several years, interest rates have been at historically low levels. The Federal Reserve raised the target federal funds rate by 25 basis points in each of December 2016, March 2017, June 2017 and December 2017. If interest rates continue to increase, banks will experience competitive pressures to increase rates paid on deposits. Depending on competitive pressures, such deposit rate increases may occur faster than increases in rates received on loans, which may reduce net interest income during the transition periods. Changes in interest rates could also influence our ability to originate loans and obtain deposits, the fair value of our financial assets and liabilities, and the average duration of our securities portfolio. Community banks, such as West Bank, rely more heavily than larger institutions on net interest income as a revenue source. Larger institutions generally have more diversified sources of noninterest income. See Item 7A of this Form 10-K for a discussion of the Company’s interest rate risk management. Technology is changing rapidly and may put us at a competitive disadvantage. The banking industry is undergoing rapid technological changes with frequent introductions of new technology-driven products and services. Effective use of technology increases efficiency and enables banks to better serve customers. Our future success depends, in part, on our ability to effectively implement new technology. Many of our larger competitors have substantially greater resources than we do to invest in technological improvements. As a result, they may be able to offer, or more quickly offer, additional or superior products that could put West Bank at a competitive disadvantage. Our stock is relatively thinly traded. Although our common stock is traded on the Nasdaq Global Select Market, the average daily trading volume of our common stock is relatively small compared to many public companies. The desired market characteristics of depth, liquidity, and orderliness require the substantial presence of willing buyers and sellers in the marketplace at any given time. In our case, this presence depends on the individual decisions of a relatively small number of investors and general economic and market conditions over which we have no control. Due to the relatively small trading volume of our common stock, significant sales of our common stock, or the expectation of these sales, could cause the stock price to fall more than would be justified by the inherent worth of the Company. Conversely, attempts to purchase a significant amount of our stock could cause the market price to rise above the reasonable inherent worth of the Company. The stock market has experienced, and may continue to experience, fluctuations that significantly impact the market prices of securities issued by many companies. Market fluctuations could adversely affect our stock price. These fluctuations have often been unrelated or disproportionate to the operating performance of particular companies. These broad market fluctuations, as well as general economic, systemic, political and market conditions, such as recessions, loss of investor confidence, interest rate changes, or international currency fluctuations, may negatively affect the market price of our common stock. Moreover, our operating results may fluctuate and vary from period to period due to the risk factors set forth herein. As a result, period-to-period comparisons should not be relied upon as an indication of future performance. Our stock price could fluctuate significantly in response to the impact these risk factors have on our operating results or financial position. Issuing additional common or preferred stock may adversely affect the market price of our common stock, and capital may not be available when needed. The Company may issue additional shares of common or preferred stock in order to raise capital at some date in the future to support continued growth, either internally generated or through an acquisition. Common shares have been and will be issued through the Company’s 2012 Equity Incentive Plan and the Company’s 2017 Equity Incentive Plan as grants of restricted stock units vest. As additional shares of common or preferred stock are issued, the ownership interests of our existing stockholders may be diluted. The market price of our common stock might decline or fail to increase in response to issuing additional common or preferred stock. Our ability to raise additional capital, if needed, will depend on conditions in the capital markets at that time, which are outside of our control. Accordingly, we cannot provide any assurance that we will be able to raise additional capital, if needed, at acceptable terms. The holders of our junior subordinated debentures have rights that are senior to those of our common stockholders. As of December 31, 2017, the Company had $20.6 million in junior subordinated debentures outstanding that were issued to the Company’s subsidiary trust, West Bancorporation Capital Trust I. The junior subordinated debentures are senior to the Company’s shares of common stock. As a result, the Company must make payments on the junior subordinated debentures (and the related trust preferred securities (TPS)) before any dividends can be paid on its common stock, and, in the event of the Company’s bankruptcy, dissolution or liquidation, the holders of the debentures must be satisfied before any distributions can be made to the holders of the common stock. The Company has the right to defer distributions on the junior subordinated debentures (and the related TPS) for up to five years during which time no dividends may be paid to holders of the Company’s common stock. The Company’s ability to pay future distributions depends upon the earnings of West Bank and the issuance of dividends from West Bank to the Company, which may be inadequate to service the obligations. Interest payments on the junior subordinated debentures underlying the TPS are classified as a “dividend” by the Federal Reserve supervisory policies and therefore are subject to applicable restrictions and approvals imposed by the Federal Reserve Board. Our common stockholders are only entitled to receive the dividends declared by our Board of Directors. Although we have historically paid quarterly dividends on our common stock, there can be no assurances that we will be able to continue to pay regular quarterly dividends or that any dividends we do declare will be in any particular amount. The primary source of money to pay our dividends comes from dividends paid to the Company by West Bank. West Bank’s ability to pay dividends to the Company is subject to, among other things, its earnings, financial condition and applicable regulations, which in some instances limit the amount that may be paid as dividends. We are required to maintain capital to meet regulatory requirements, and if we fail to maintain sufficient capital, whether due to an inability to raise capital, operational losses, or otherwise, our financial condition, liquidity and results of operations, as well as our ability to maintain regulatory compliance, could be adversely affected. The Company and West Bank are required by federal and state regulatory authorities to maintain adequate levels of capital to support their operations. The ability to raise additional capital, when and if needed, will depend on conditions in the capital markets, economic conditions, and a number of other factors, including investor perceptions regarding the banking industry and market conditions, and governmental activities, many of which are outside of our control, as well as on our financial condition and performance. Accordingly, we cannot provide assurance that we will be able to raise additional capital, if needed, or on terms acceptable to us. Failure to meet these capital and other regulatory requirements could affect customer confidence, our ability to grow, the costs of funds, FDIC insurance costs, the ability to pay dividends on common stock and to make distributions on the junior subordinated debentures, the ability to make acquisitions, the ability to make certain discretionary bonus payments to executive officers, and the results of operations and financial condition. The corporate office of the Company is located in the main office building of West Bank, at 1601 22nd Street in West Des Moines, Iowa. West Bank leases its main office, including a full-service bank location that includes drive-up facilities, one automated teller machine and one integrated teller machine. In addition to its main office, West Bank also leases bank buildings and space for six branch offices located in the Des Moines, Iowa, metropolitan area and office space for operational departments. Three branch offices are full-service locations with drive-up facilities and an automated teller machine. The other three branch offices are drive-up only, express locations and offer drive-up services and an automated teller machine. West Bank also owns four full-service banking locations in Iowa City, Coralville and Waukee, Iowa, and Rochester, Minnesota. We believe each of our facilities is adequate to meet our needs. Neither the Company nor West Bank is party to any material pending legal proceedings, other than ordinary litigation incidental to West Bank’s business, and no property of these entities is the subject of any such proceeding. The Company does not know of any proceedings contemplated by a governmental authority against the Company or West Bank. West Bancorporation common stock is traded on the Nasdaq Global Select Market under the symbol “WTBA.” The table below shows the high and low sale prices and cash dividends on common stock declared for each quarter, and the closing price at the end of each quarter, in 2017 and 2016. The market quotations, reported by Nasdaq, do not include retail markup, markdown or commissions. There were 188 holders of record of the Company’s common stock as of February 16, 2018, and an estimated 2,600 additional beneficial holders whose stock was held in street name by brokerages or fiduciaries. The closing price of the Company’s common stock was $24.85 on February 16, 2018. In the aggregate, cash dividends paid to common stockholders in 2017 and 2016 were $0.71 and $0.67 per common share, respectively. Dividend declarations are evaluated and determined by the Board of Directors on a quarterly basis, and the dividends are paid quarterly. The ability of the Company to pay dividends in the future will depend primarily upon the earnings of West Bank and its ability to pay dividends to the Company. The ability of West Bank to pay dividends is governed by various statutes. These statutes provide that a bank may pay dividends only out of undivided profits. In addition, applicable bank regulatory authorities have the power to require any bank to suspend the payment of dividends until the bank complies with all requirements that may be imposed by such authorities. The Company does not currently have a stock repurchase plan in place. No shares were repurchased during 2017. 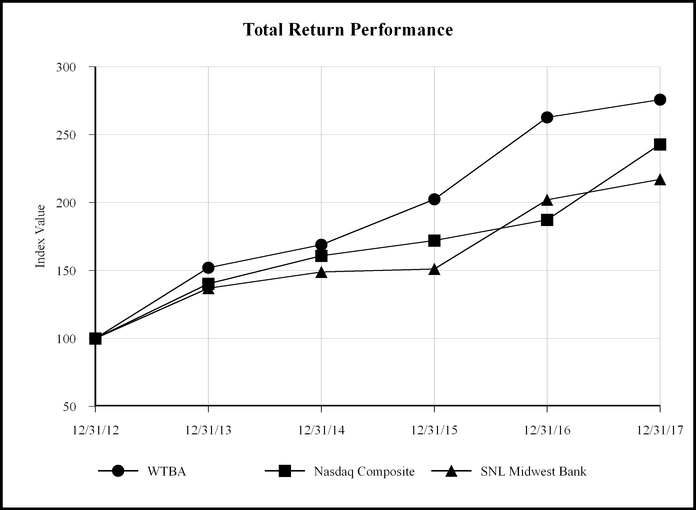 The following performance graph provides information regarding the cumulative, five-year return on an indexed basis of the common stock of the Company as compared with the Nasdaq Composite Index and the SNL Midwest Bank Index prepared by S&P Global Market Intelligence. The latter index reflects the performance of bank holding companies operating principally in the Midwest as selected by S&P Global Market Intelligence. The indices assume the investment of $100 on December 31, 2012, in the common stock of the Company, the Nasdaq Composite Index and the SNL Midwest Bank Index, with all dividends reinvested. The Company’s common stock price performance shown in the following graph is not indicative of future stock price performance. *Source: S&P Global Market Intelligence. Used with permission. All rights reserved. Average equity to average assets ratio - average equity divided by average assets. Return on average assets - net income divided by average assets. Return on average equity - net income divided by average equity. Efficiency ratio - noninterest expense (excluding other real estate owned expense) divided by noninterest income (excluding net securities gains, net impairment losses and gains/losses on disposition of premises and equipment) plus tax-equivalent net interest income. Net interest margin - tax-equivalent net interest income divided by average interest-earning assets. Dividend payout ratio - dividends paid to common stockholders divided by net income. Dividend yield - dividends per share paid to common stockholders divided by closing year-end stock price. (1) A lower ratio is better. (2) As presented, this is a non-GAAP financial measure. See Part II, Item 7 - "Non-GAAP Financial Measures" for additional details. The Company’s 2017 net income was $23,070 compared to $23,016 in 2016. Net income for 2017 was a record for the Company, even after recording an additional provision for income taxes of $2,340 as a result of the Tax Cuts and Jobs Act of 2017 (the Tax Act) legislation that was signed into law on December 22, 2017. Basic and diluted earnings per common share for 2017 were $1.42 and $1.41, respectively, compared to $1.43 and $1.42, respectively, in 2016. During 2017, we paid our common stockholders $11,499 ($0.71 per common share) in dividends compared to $10,800 ($0.67 per common share) in 2016. The dividend declared and paid in the first quarter of 2018 was $0.18 per common share, the same amount as paid in the fourth quarter of 2017, and is the highest quarterly dividend ever paid by the Company. Pre-tax net income for 2017 increased $3,486 compared to 2016, mainly due to the combination of higher net interest income, a reduction in the provision for loan losses and growth in noninterest income. These improvements were partially offset by an increase in noninterest expense in 2017 compared to 2016. As previously mentioned, income tax expense for 2017 included a one-time adjustment to net deferred tax assets as a result of the enactment of the Tax Act. The Tax Act lowers the federal corporate income tax rate to 21 percent beginning in 2018 from a maximum rate of 35 percent in 2017. This reduction in the federal corporate income tax rate required the Company to revalue the Company’s net deferred tax assets as of December 31, 2017, in accordance with GAAP, based upon the future lower income tax rate, and in turn caused the one-time increase in tax expense. This adjustment did not increase the amount of income taxes actually paid by the Company. Our loan portfolio grew to $1,510,500 as of December 31, 2017, from $1,399,870 at the end of 2016. Deposits increased to $1,810,813 as of December 31, 2017, from $1,546,605 as of December 31, 2016. The growth in both was the result of our bankers working with existing customers to provide them with additional products and services, as well as business development efforts targeted at new customers. Our loan portfolio continues to have a high level of credit quality, as nonperforming assets declined further in 2017 compared to 2016. As shown in the table below, our Texas ratio was significantly better than that of any financial institution in our defined peer group. The Company has a quantitative peer analysis program in place for evaluating our results. The Company's benchmarking peer group of 16 financial institutions are selected based on their business focus, scope and location of operations, size and other considerations. The Company is in the middle of the group in terms of asset size. The group is periodically reviewed, with changes made primarily to reflect merger and acquisition activity. During the third quarter of 2017 one peer ceased to exist due to a merger, so it was removed from the group. An additional financial institution will be added to the peer group in 2018. The group of 15 Midwestern, publicly traded, peer financial institutions against which we compared our performance for 2017 consisted of BankFinancial Corporation, Farmers Capital Bank Corporation, First Business Financial Services, Inc., First Defiance Financial Corp., First Mid-Illinois Bancshares, Inc., Hills Bancorporation, Horizon Bancorp, Isabella Bank Corporation, Mercantile Bank Corporation, MidWestOne Financial Group, Inc., MutualFirst Financial, Inc., Nicolet Bankshares, Inc., Peoples Bancorp, QCR Holdings, Inc. and Waterstone Financial, Inc. Our goal is to perform at or near the top of these peers relative to what we consider to be four key metrics: return on average assets (ROA), return on average equity (ROE), efficiency ratio and Texas ratio. We believe these measures encompass the factors that define the performance of a community bank. When contrasted with the peer group’s metrics for the nine months ended September 30, 2017 (latest data available), the Company’s metrics for the year ended December 31, 2017 were better than those of each company in the peer group as shown in the table below, except for one peer that had a higher ROA. We expect that trend to have continued through the end of 2017. * A lower ratio is better. As presented, this is a non-GAAP financial measure. For further information, refer to the section “Non-GAAP Financial Measures” of this Item. The Company’s ratios for the year ended December 31, 2017, were affected by a one-time increase in federal income tax expense related to the enactment of the Tax Act on December 22, 2017. Management expects peer results to be similarly affected by the Tax Act. Our earnings outlook is positive, and we have strong capital resources. We anticipate the Company will be profitable in 2018 at a level that compares favorably with that of our peers. We expect net income in 2018 to be positively impacted by the Tax Act. Our expected effective income tax rate for 2018 is approximately 20 percent. The amount of our future profit is also dependent, in large part, on our ability to continue to grow the loan portfolio, the amount of loan losses we incur, fluctuations in market interest rates, and the strength of the local and national economy. The following discussion describes the consolidated operations and financial condition of the Company, including West Bank and West Bank’s wholly-owned subsidiary WB Funding Corporation (which owned an interest in a limited liability company that was sold in 2015). Results of operations for the year ended December 31, 2017 are compared to the results for the year ended December 31, 2016; results of operations for the year ended December 31, 2016 are compared to the results for the year ended December 31, 2015; and the consolidated financial condition of the Company as of December 31, 2017 is compared to December 31, 2016. This report is based on the Company’s audited consolidated financial statements, which have been prepared in accordance with GAAP established by the FASB. The preparation of the Company’s financial statements requires management to make estimates and judgments that affect the reported amounts of assets, liabilities, income and expenses. These estimates are based upon historical experience and on various other assumptions that management believes are reasonable under the circumstances, the results of which form the basis for making judgments about the carrying values of assets and liabilities that are not readily apparent from other sources. Actual results may differ from these estimates under different assumptions or conditions. The Company’s significant accounting policies are described in the Notes to Consolidated Financial Statements. Based on its consideration of accounting policies that involve the most complex and subjective estimates and judgments, management has identified its most critical accounting policies to be those related to the fair value of financial instruments and the allowance for loan losses. The fair value of a financial instrument is defined as the price that would be received to sell an asset or paid to transfer a liability in an orderly transaction between market participants in the market in which the reporting entity transacts business. A framework has been established for measuring the fair value of financial instruments that considers the attributes specific to particular assets or liabilities and includes a three-level hierarchy for determining fair value based on the transparency of inputs to each valuation as of the measurement date. The Company estimates the fair value of financial instruments using a variety of valuation methods. When financial instruments are actively traded and have quoted market prices, quoted market prices are used for fair value and are classified as Level 1. When financial instruments, such as investment securities and derivatives, are not actively traded, the Company determines fair value based on various sources and may apply matrix pricing with observable prices for similar instruments where a price for the identical instrument is not observable. The fair values of these financial instruments, which are classified as Level 2, are determined by pricing models that consider observable market data such as interest rate volatilities, LIBOR yield curve, credit spreads, prices from external market data providers and/or nonbinding broker-dealer quotations. When observable inputs do not exist, the Company estimates fair value based on available market data, and these values are classified as Level 3. Imprecision in estimating fair values can impact the carrying value of assets and the amount of revenue or loss recorded. The allowance for loan losses is established through a provision for loan losses charged to expense. Loans are charged against the allowance for loan losses when management believes that collectability of the principal is unlikely. The Company has policies and procedures for evaluating the overall credit quality of its loan portfolio, including timely identification of potential problem loans. On a quarterly basis, management reviews the appropriate level for the allowance for loan losses, incorporating a variety of risk considerations, both quantitative and qualitative. Quantitative factors include the Company’s historical loss experience, delinquency and charge-off trends, collateral values, known information about individual loans and other factors. Qualitative factors include the general economic environment in the Company’s market areas and the expected trend of those economic conditions. While management uses the best information available to make its evaluation, future adjustments to the allowance may be necessary if there are significant changes in economic conditions or the other factors considered. To the extent that actual results differ from forecasts and management’s judgment, the allowance for loan losses may be greater or less than future charge-offs. This report contains references to financial measures that are not defined in GAAP. Such non-GAAP financial measures include the Company’s presentation of net interest income and net interest margin on a fully taxable equivalent (FTE) basis, and the presentation of the efficiency ratio on an FTE basis, excluding certain income and expenses. Management believes these non-GAAP financial measures provide useful information to both management and investors to analyze and evaluate the Company’s financial performance. Both measures are considered standard measures of comparison within the banking industry. Limitations associated with non-GAAP financial measures include the risks that persons might disagree as to the appropriateness of items included in these measures and that different companies might calculate these measures differently. These non-GAAP disclosures should not be considered an alternative to the Company’s GAAP results. The following table reconciles the non-GAAP financial measures of net interest income, net interest margin and efficiency ratio on an FTE basis to GAAP. (1) Computed on a tax-equivalent basis using an incremental federal income tax rate of 35 percent, adjusted to reflect the effect of the nondeductible interest expense associated with owning tax-exempt securities and loans. (2) The efficiency ratio expresses noninterest expense as a percent of fully taxable equivalent net interest income and noninterest income, excluding specific noninterest income and expenses. Management believes the presentation of this non-GAAP measure provides supplemental useful information for proper understanding of the financial results, as it enhances the comparability of income and expenses arising from taxable and nontaxable sources. ROA was 1.18 percent compared to 1.27 percent in 2016. ROE was 13.29 percent compared to 14.35 percent in 2016. Efficiency ratio was 45.39 percent compared to 46.03 percent in 2016. Texas ratio was 0.32 percent compared to 0.56 percent in 2016. The loan portfolio grew 7.9 percent during 2017. Deposits increased by 17.1 percent during 2017. Net income for the year ended December 31, 2017, was $23,070, compared to $23,016 for the year ended December 31, 2016. Basic and diluted earnings per common share for 2017 were $1.42 and $1.41, respectively, and were $1.43 and $1.42, respectively, for 2016. The improvement in 2017 net income compared to 2016 was primarily the result of an increase in interest income due to growth in average earning assets, which exceeded the increase in interest expense on deposits and borrowed funds. The Company recorded no provision for loan losses in 2017 compared to $1,000 in 2016. Noninterest income increased $666, or 8.3 percent, in 2017 compared to 2016, mainly as the result of an increase in revenue from trust services, net gains on sales of investment securities and higher service charges on deposit accounts. Partially offsetting these positive changes for 2017 was a $1,119, or 3.6 percent, increase in noninterest expense. Noninterest expense grew primarily due to increases in salaries and benefits. As previously mentioned, 2017 income tax expense was impacted by a one-time increase of $2,340 due to the enactment of tax legislation. The Company has consistently used the efficiency ratio as one of its key financial metrics to measure expense control. For the year ended December 31, 2017, the Company’s efficiency ratio improved slightly to 45.39 percent from the prior year’s ratio of 46.03 percent. This ratio is computed by dividing noninterest expense (excluding other real estate owned expense) by the sum of tax-equivalent net interest income plus noninterest income (excluding net investment securities gains, net impairment losses and gains/losses on disposition of premises and equipment). The ratio for both years was significantly better than the respective averages of our peer group, which were approximately 66 percent and 68 percent, respectively, according to data in the September 2017 and December 2016 Bank Holding Company Performance Reports, which are prepared by the Federal Reserve Board’s Division of Banking Supervision and Regulation. The Texas ratio, which is the ratio of nonperforming assets to tangible capital plus the allowance for loan losses, improved to 0.32 percent as of December 31, 2017, compared to 0.56 percent as of December 31, 2016. A lower Texas ratio indicates a stronger credit quality condition. The ratio for both years was significantly better than peer group averages, which were approximately 8 percent and 10 percent, respectively, according to data in the September 2017 and December 2016 Bank Holding Company Performance Reports. For more discussion on loan quality, see the “Loan Portfolio” and “Summary of the Allowance for Loan Losses” sections in this Item of this Form 10-K.
Net interest income increased to $60,057 for 2017 from $57,118 for 2016, as the impact of the growth of interest-earning assets exceeded the effect of an increase in the average rate paid on interest-bearing liabilities. The net interest margin for 2017 declined 12 basis points to 3.37 percent compared to 3.49 percent for 2016. The average yield on earning assets increased by 11 basis points, while the rate paid on interest-bearing liabilities increased by 27 basis points. As a result, the net interest spread, which is the difference between the yields earned on assets and the rates paid on liabilities, declined to 3.11 percent in 2017 from 3.27 percent in 2016. Management expects there to be continued pressure on the net interest margin in 2018. For additional analysis of net interest income, see the section captioned “Distribution of Assets, Liabilities and Stockholders’ Equity; Interest Rates; and Interest Differential” in this Item of this Form 10-K. The allowance for loan losses, which totaled $16,430 as of December 31, 2017, represented 1.09 percent of total loans and 2,641.5 percent of nonperforming loans at year end, compared to 1.15 percent and 1,576.5 percent, respectively, as of December 31, 2016. No provision for loan losses was recorded for 2017 compared to $1,000 for 2016, as recoveries on previously charged off loans exceeded charge-offs in 2017. The net recoveries were sufficient to increase the allowance for loan losses to a level deemed appropriate in relation to the 2017 loan growth and strong credit quality. Net recoveries were 0.02 percent of average loans for 2017 compared to net recoveries of 0.01 percent for 2016. Nonperforming loans at December 31, 2017 totaled $622, or 0.04 percent of total loans, down from $1,022, or 0.07 percent of total loans, at December 31, 2016. Nonperforming loans include loans on nonaccrual status, loans past due 90 days or more, and loans that have been considered to be troubled debt restructured (TDR) due to the borrowers’ financial difficulties. The Company held no other real estate properties as of December 31, 2017 or 2016. The following table shows the variance from the prior year in the noninterest income categories shown in the Consolidated Statements of Income. In addition, accounts within the “Other income” category that represent a significant portion of the total or a significant variance are shown. The increase in service charges on deposit accounts for 2017 compared to 2016 was driven by the March and April 2017 realignment and simplification of the retail checking account products provided to our customers. We expect retail service charges in 2018 to exceed those in 2017, but management cannot predict how customers might modify their banking behavior in response to the change in checking account terms related to product realignment. Nonsufficient funds fees declined $126 in 2017 compared to 2016, consistent with the trend of the past several years. Revenue from trust services was higher in 2017 than in 2016 due to the combination of a higher amount of one-time estate fees, and asset growth achieved through ongoing business development efforts and strong financial markets. Gain from bank-owned life insurance was recognized for both 2017 and 2016. The Company recognized net gains on sales of investment securities in 2017, as the Company took advantage of the opportunity to sell various types of investment securities available for sale at net gains and reinvested the proceeds in higher yielding securities with similar risk profiles and slightly longer durations. The Company recognized investment securities gains of $66 during 2016. Loan fees declined in 2017 compared to the previous year, as 2016 included one-time fees of $39 from public company floating rate commercial loans. Letter of credit fees declined due to a lower level of standby letters of credit activity in 2017 compared to 2016. Volumes of letters of credit fluctuate based upon the needs of our commercial customers. Gain on sale of other assets in 2017 included a nonrecurring gain related to a final payment received from the 2015 sale of WB Funding’s investment in SmartyPig, LLC. The Company plans to dissolve WB Funding early in 2018. Total revenue from discounts on purchased State of Iowa transferable income tax credits were higher in 2017 than in 2016 because the Company entered into additional agreements to purchase tax credits at a discount. The Company reviews opportunities to acquire transferable State of Iowa income tax credits at favorable discounts as they are presented and as they are aligned with our projected ability to utilize them. The Company’s previous agreement to purchase wind energy tax credits expired in May 2017. All other income declined in 2017 compared to 2016, primarily due to small losses on equipment disposals in 2017. The following table shows the variance from the prior year in the noninterest expense categories shown in the Consolidated Statements of Income. In addition, accounts within the “Other expenses” category that represent a significant portion of the total or a significant variance are shown. Salaries and employee benefits increased in 2017 compared to 2016, mainly as a result of an increase in the market price of Company common stock, which increased stock-based compensation costs. Occupancy costs increased for 2017 compared to 2016, partially as the result of operating costs associated with the new Rochester Minnesota, office, which opened in November 2016. Also impacting the increase in occupancy costs compared to the prior year was a first quarter 2016 one-time reversal of previously accrued rent related to the terms of the previous lease for the Waukee, Iowa, branch facility at the time the branch was acquired in February 2016. The increase in data processing expense in 2017 compared to 2016 was primarily because of costs associated with upgrading credit analysis software, one-time costs associated with revising the retail checking account products, ongoing enhancements and monitoring tools for maintaining security, and an annual inflation-rate-based contractual increase in fees paid to our core applications system service provider. The FDIC assessment rate calculation includes a series of risk-based factors. In May 2017, the Company contributed capital in the amount of $40,000 into West Bank, and as a result, the capital ratio component improved enough to reduce the assessment rate to the minimum base assessment level established by the FDIC. This reduction in rate is the primary reason for the decline in FDIC insurance expense for 2017 compared to 2016. Management believes the assessment rate will remain at the minimum level in 2018 based on the Company’s strong capital position, but expects the FDIC premium expense to increase due to the Company’s asset growth. Professional fees increased for 2017 compared to 2016, chiefly due to increased costs associated with preparation and adoption of the West Bancorporation, Inc. 2017 Equity Incentive Plan, filing an updated shelf registration statement with the SEC (which allows us to issue registered equity and debt instruments), services performed to analyze capital and debt structures, and higher legal fees at West Bank. Director fees increased in 2017 from 2016 due to higher stock-based compensation costs. The increase in business development expense in 2017 compared to 2016 was the result of efforts to cultivate new and expanded customer relationships. Investment advisory fees declined in 2017 from 2016, mainly as a result of bringing the administration of the investment portfolio in-house, effective October 1, 2016. The Company also pays an administrative fee to an investment management firm for the administration of public company floating rate commercial loans. That administration fee declined as a result of holding a lower level of those loans. Investment advisory fees are expected to decline further in 2018 as the Company does not plan to add any additional public company floating rate commercial loans to our portfolio. The increase in subscription costs in 2017 as contrasted to 2016 was primarily caused by subscribing to enhanced fraud monitoring, business continuity and investment research services. All other expenses declined for 2017 compared to 2016, primarily due to the elimination of certain costs related to a retail deposit product and lower loan-related costs. Additionally, first quarter 2016 included a one-time cost associated with a bank-owned life insurance claim. The Company records a provision for income tax expense currently payable, along with a provision for those taxes payable or refundable in the future (deferred taxes). Deferred taxes arise from differences in the timing of certain items for financial statement reporting compared to income tax reporting and are measured using enacted tax rates expected to apply to taxable income in the years in which those temporary differences are expected to be recovered or settled. Federal income tax expense for 2017 and 2016 was approximately $11,349 and $8,335, respectively, while state income tax expense was approximately $2,019 and $1,601, respectively. The effective rate of income tax expense as a percent of income before income taxes was 36.7 percent and 30.2 percent, respectively, for 2017 and 2016. Income tax expense for 2017 included a one-time increase in federal income tax expense related to the enactment of the Tax Act. This legislation reduces the federal corporate income tax rate for 2018 and future years from the current maximum rate of 35 percent to a flat tax rate of 21 percent. This future reduction in the corporate tax rate required the Company to reduce net deferred tax assets as of December 31, 2017 by $2,340 and in turn caused the one-time increase in 2017 tax expense. Exclusive of the one-time increase in 2017 federal income tax expense, the effective income tax rate differs from the federal statutory income tax rate primarily due to tax-exempt interest income, the tax-exempt increase in cash value of bank-owned life insurance, tax-exempt gain on bank-owned life insurance, disallowed interest expense and state income taxes. Two other items significantly impacted the effective tax rate for 2017 compared to 2016. The first item was the adoption of ASU No. 2016-09, Compensation—Stock Compensation (Topic 718), effective January 1, 2017, which simplified the recording of income taxes related to vesting of equity compensation. The impact of an increase in the fair value of restricted stock over the vesting period is now recorded as a reduction in income tax expense rather than as additional paid-in capital. During 2017, a tax benefit of $285 was recorded as a result of this change in accounting method. By comparison, the tax benefit recorded in additional paid-in capital for 2016 was $105. The second item impacting the effective tax rate for both years was federal income tax credits, including low income housing tax credits, of approximately $410 and $405, respectively. The parent Company continues to maintain a valuation allowance against the tax effect of state net operating losses carryforwards, as management believes it is likely that such carryforwards will expire without being utilized. ROA was 1.27 percent compared to 1.30 percent in 2015. ROE was 14.35 percent compared to 14.88 percent in 2015. Efficiency ratio was 46.03 percent compared to 46.30 percent in 2015. Texas ratio was 0.56 percent compared to 0.87 percent in 2015. The loan portfolio grew 12.3 percent during 2016. Deposits increased by 7.3 percent during 2016. Net income for the year ended December 31, 2016, was $23,016, compared to $21,742 for the year ended December 31, 2015. Basic and diluted earnings per common share for 2016 were $1.43 and $1.42, respectively, and were $1.35 and $1.35, respectively, for 2015. The improvement in 2016 net income compared to 2015 was primarily the result of an increase in interest income due to growth in average loan volume. Growth in loans outstanding required a provision for loan losses of $1,000 in 2016, compared to a provision of $850 in 2015. Noninterest income declined $221 in 2016 compared to 2015. Noninterest income in 2015 included a gain of $590 from the sale of WB Funding’s investment in SmartyPig, LLC, while 2016 included a $443 tax-exempt gain from bank-owned life insurance. Meanwhile, noninterest expense increased $1,080 between 2015 and 2016 primarily due to increases in salaries and benefit costs and higher low income housing projects amortization. As shown above, the Company’s efficiency ratio for 2016 improved slightly compared to 2015. The ratio for both years was significantly better than our peer group’s averages, which were approximately 68 percent and 70 percent, respectively, according to data in the December 2016 and December 2015 Bank Holding Company Performance Reports. Net interest income increased to $57,118 for 2016 from $54,154 for 2015 as the impact of loan growth exceeded the effect of an increase in the average rate paid on interest-bearing liabilities. The net interest margin for 2016 declined 10 basis points to 3.49 percent compared to 3.59 percent for 2015. The average yield on earning assets declined by one basis point, while the rate on interest-bearing liabilities increased 14 basis points. As a result, the net interest spread declined to 3.27 percent for 2016 from 3.42 percent a year earlier. The allowance for loan losses, which totaled $16,112 as of December 31, 2016, represented 1.15 percent of total loans and 1,576.5 percent of nonperforming loans at year end, compared to 1.20 percent and 1,024.4 percent, respectively, as of December 31, 2015. The provision for loan losses increased to $1,000 in 2016 compared to $850 for 2015 due to growth in the loan portfolio. The Company experienced net recoveries of 0.01 percent of average loans for 2016 compared to net recoveries of 0.04 percent for 2015. Nonperforming loans at December 31, 2016 totaled $1,022, or 0.07 percent of total loans, down from $1,461, or 0.12 percent of total loans, at December 31, 2015. The Company held no other real estate properties as of December 31, 2016 or 2015. Service charges on deposit accounts declined in 2016 compared to 2015 primarily due to lower fees resulting from fewer instances of nonsufficient funds as customers continued to improve monitoring of their account balances. Revenue from trust services was higher in 2016 than in 2015 due to the combination of successful business development efforts, pricing updates for certain account types, and higher asset values. The increase in cash value of bank-owned life insurance was lower in 2016 than in 2015 as crediting rates within the policies declined slightly due to the low interest rate environment. Gain from bank-owned life insurance was recognized in 2016, while none was recognized in 2015. Loan fees declined in 2016 compared to 2015 due to the recognition of a previously deferred rate lock fee on one loan in 2015. Letter of credit fees grew due to the increase in the amount of standby letters of credit activity in 2016 compared to 2015.
Credit card fees increased in 2016 compared to 2015 due to both higher volumes of transactions and an increase in the number of credit cards issued through a third party. Gain on sale of other assets in 2015 was associated with the sale of WB Funding’s investment in SmartyPig, LLC. Total revenue from discounts on purchased State of Iowa income tax credits were higher in 2016 than in 2015 because the Company purchased one Enterprise Zone tax credit at a discount of $33 in 2016. During 2016 and 2015, the Company also had an agreement to purchase wind energy tax credits at a discount. Salaries and employee benefits increased in 2016 compared to 2015 primarily as the result of increases in stock-based compensation costs, health insurance, defined contribution plan expenses and payroll taxes. The increases in defined contribution plan expenses and payroll taxes were primarily associated with a one-time payout of accrued vacation that occurred in 2016 in conjunction with a change in the Company’s vacation carryover policy. Occupancy costs declined for 2016 compared to 2015 primarily as the result of the February 2016 purchase of the Waukee, Iowa, branch facility. Occupancy costs in 2016 included a one-time reversal of previously accrued rent related to the terms of the previous lease. The increase in data processing expense in 2016 compared to 2015 was primarily because of the implementation of additional security measures, technology upgrades, and an annual contractual increase in fees paid to our core processor that is based upon an inflation factor. FDIC insurance expense increased for 2016 compared to 2015 due to the combination of growth in total assets and a July 1, 2016 revision in the assessment rate system for institutions with less than $10 billion in total assets. Investment advisory fees consisted of fees paid to an independent investment advisory firm for assistance with managing the investment portfolio through September 30, 2016, and an administrative fee charged by an investment management firm for assisting with the purchase and administration of public company floating rate commercial loans. As previously mentioned, management of the investment portfolio was brought in-house effective October 1, 2016. Charitable contributions were higher in 2015 than in 2016 as management made a decision to make an extra contribution to the West Bancorporation Foundation in 2015. Consulting fees increased in 2016 compared to 2015 primarily due to expenses relating to data analysis conducted in association with class action litigation that was disclosed in prior filings. A proposed settlement of $250 was reached in the fourth quarter of 2016 and was approved in the first quarter of 2017. An insurance reimbursement of litigation costs in the amount of $300 was received in the fourth quarter of 2016. The increase in low income housing projects amortization in 2016 compared to 2015 was related to the Company committing in both years to invest in additional projects. Offsetting the amortization expense in both 2016 and 2015 were approximately $375 and $275, respectively, of federal low income housing tax credits, which reduced federal income tax expense. Federal income tax expense was approximately $8,335 and $8,169 for 2016 and 2015, respectively, while state income tax expense was approximately $1,601 and $1,528, respectively. The effective rate of income tax expense as a percent of income before income taxes was 30.2 percent and 30.8 percent, respectively, for 2016 and 2015. The effective income tax rate for both years differs from the federal statutory income tax rate primarily due to tax-exempt interest income, the tax-exempt increase in cash value of bank-owned life insurance, disallowed interest expense and state income taxes. Income tax expense for 2016 was also lower than the statutory income tax rate due to the previously mentioned tax-exempt gain from bank-owned life insurance. Income tax expense for 2015 was approximately $130 lower than would be expected due to utilization of approximately $372 of capital loss carryforwards. The capital gains were generated from the sale of the Company’s investment in SmartyPig, LLC in 2015. The effective tax rate for both years was also impacted by federal tax credits, including the previously mentioned low income housing tax credits and an energy tax credit of approximately $30 in 2016 related to the new Rochester, Minnesota, building. The following table shows average balances and interest income or interest expense, with the resulting average yield or rate by category of average interest-earning assets or interest-bearing liabilities for the years indicated. Interest income and the resulting net interest income are shown on a fully taxable basis.